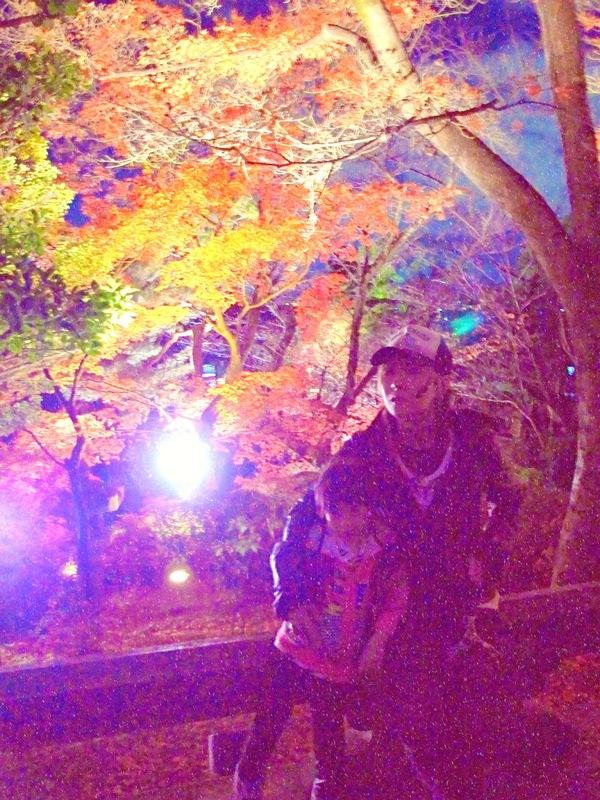 A Magical Night @ Kiyomizudera – Fall Illuminations! A Quick Dinner Before the Main Event of the Year!! After you are seated, each diner is usually served with a free glass of water or tea. If it is not served, free water or tea is usually available for self service somewhere in the restaurant. 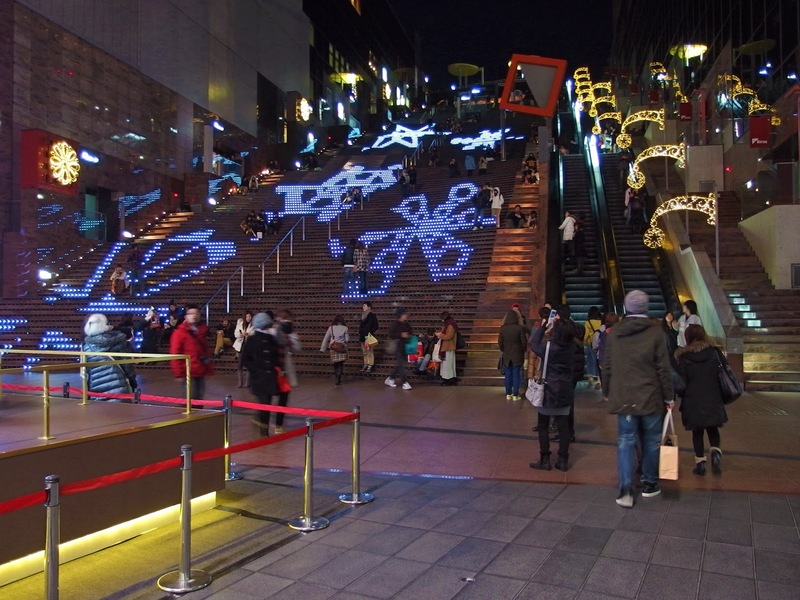 Everyone will also receive an oshibori. 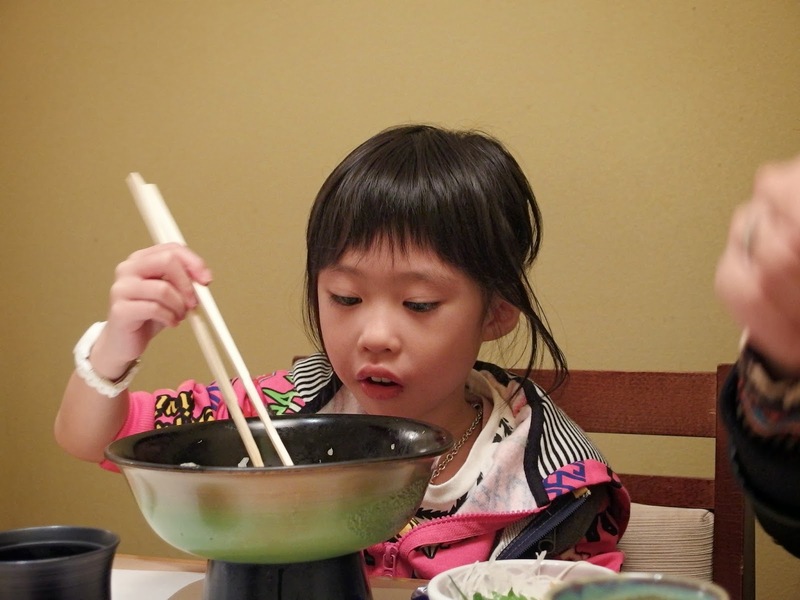 Oshibori means “wet towel” and is used to clean your hands before eating. 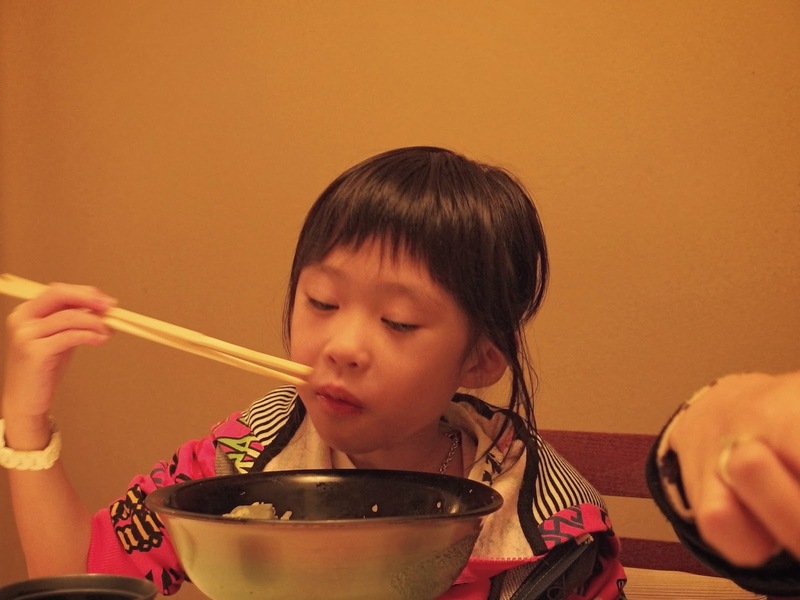 If chopsticks are not already set, you can usually find some in a box on the table. 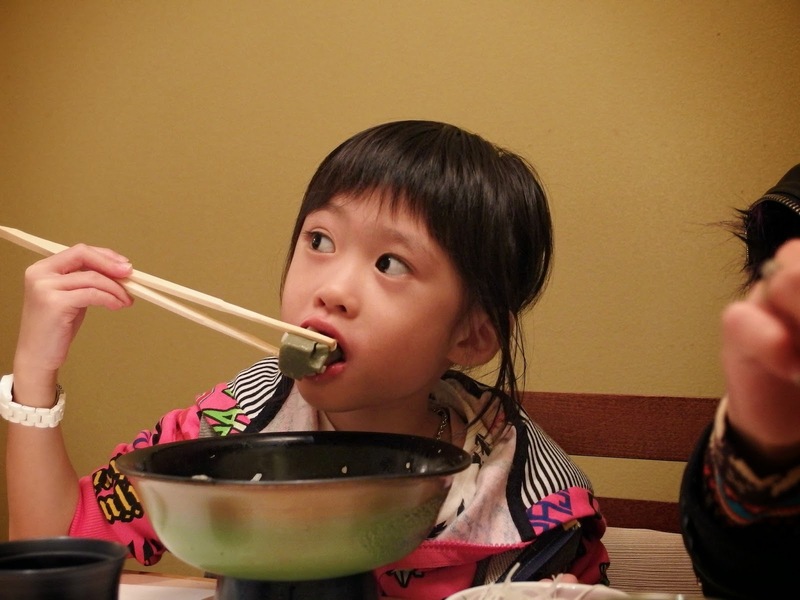 Most often, they are disposable wooden chopsticks that need to be separated into two before usage. 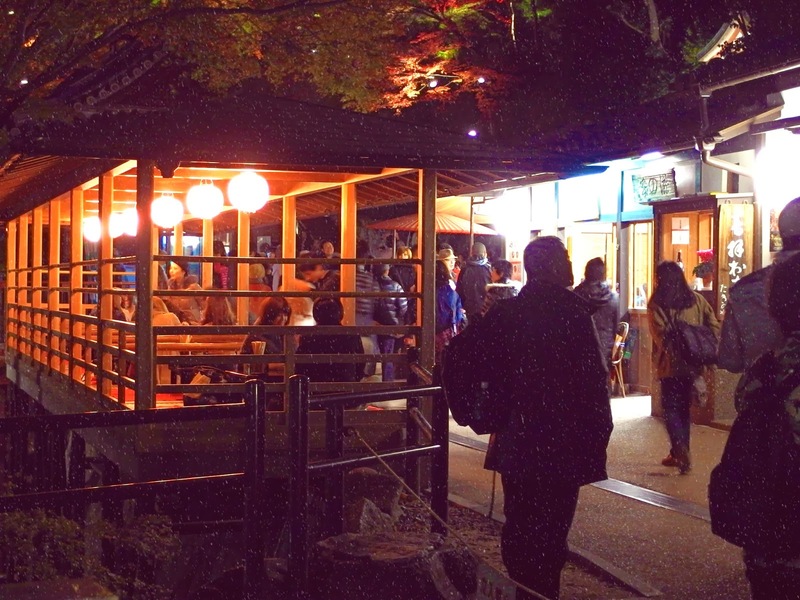 While many restaurants provide illustrated menus, other restaurants may only have Japanese text based menus, or the restaurant’s offerings may instead be posted on the walls. If you are ever in doubt on what to order or find that you cannot read the menu, try asking for the recommendations or the chef’s choice. 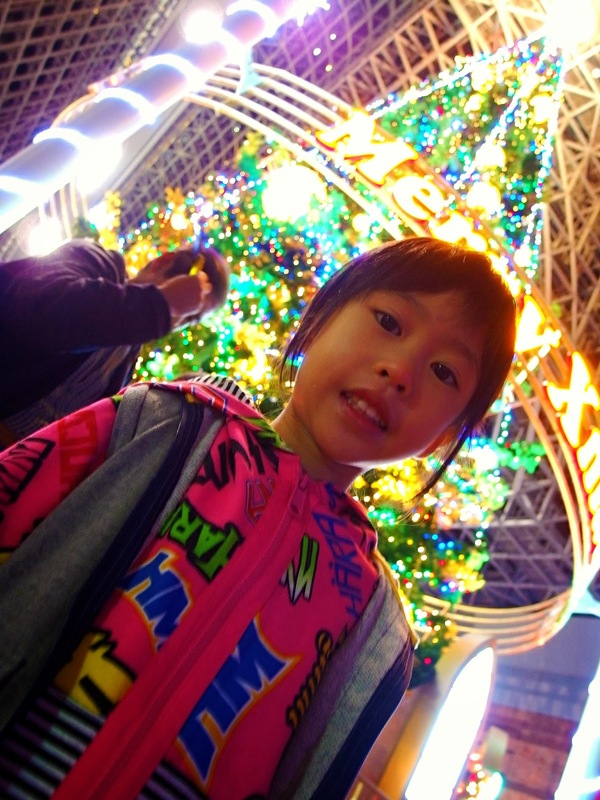 If you need to, just mention: “osusume” or “omakase”. The latter will often get you some surprisingly good, random fix style meals, but be prepared to be adventurous and do not expect it to be cheap. 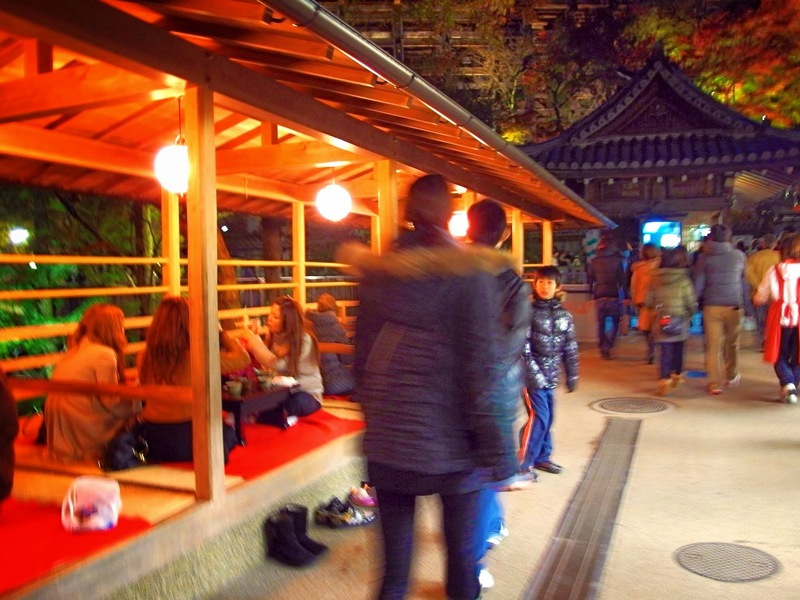 Once you are ready to order, you can signal the restaurant staff by saying “sumimasen” (excuse me), or if available, press the call button at the table. Once you have finished ordering, the waitress will often repeat your order back to you for confirmation. 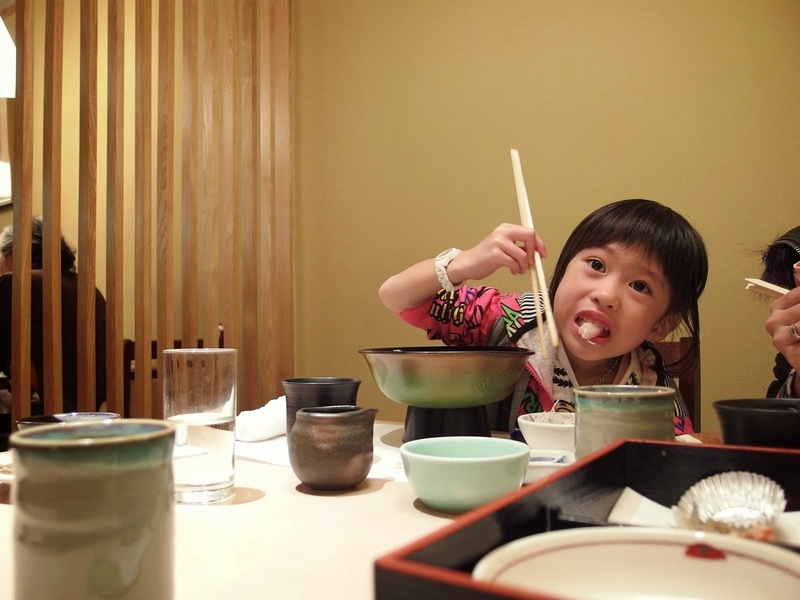 At some restaurants, such as Izakaya, it is common for everyone in the party to order dishes together and share them. At other establishments, however, each diner is expected to order individually. 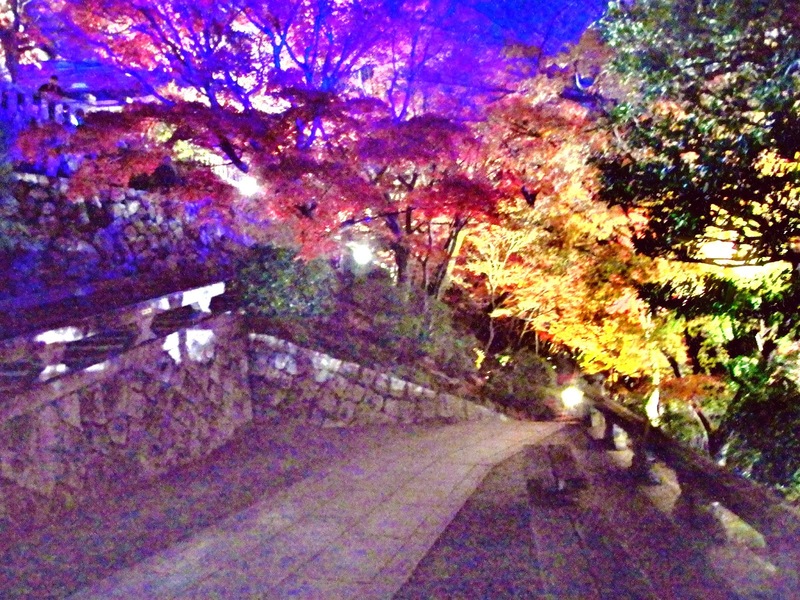 And now, it’s time for Kyoto’s main event of the year!! 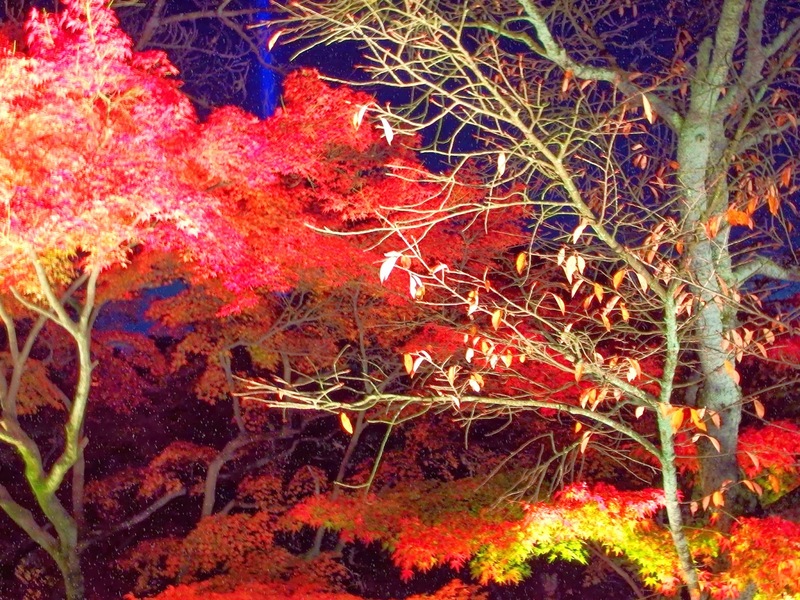 The leaves have been quickly turning red due to a drop in the temperature over the last few days. Before I start this post, I’m gonna warn you beforehand. This post is super picture heavy, so beware long loading times! However, trust me please – these long load times will be well worth the wait! Tah-dah! 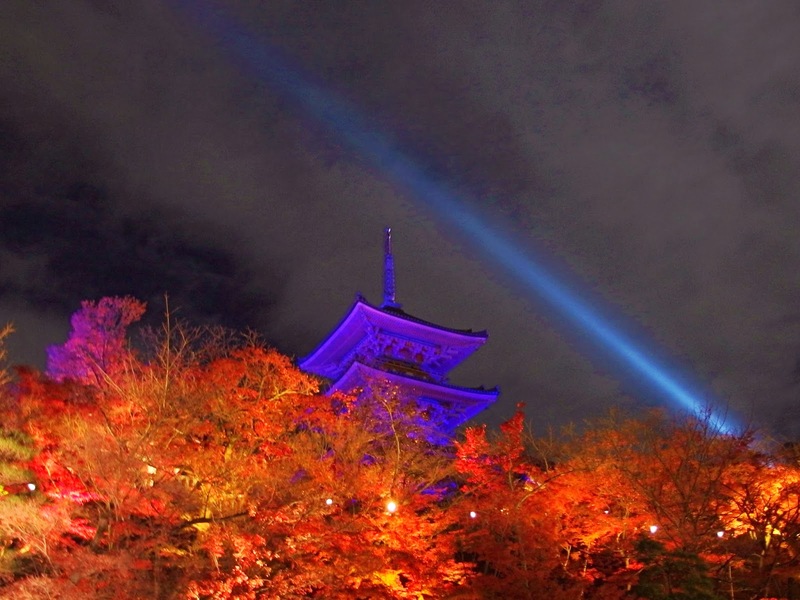 Behold the spectacular autumn colors of the Kiyomizudera Illumination festival! 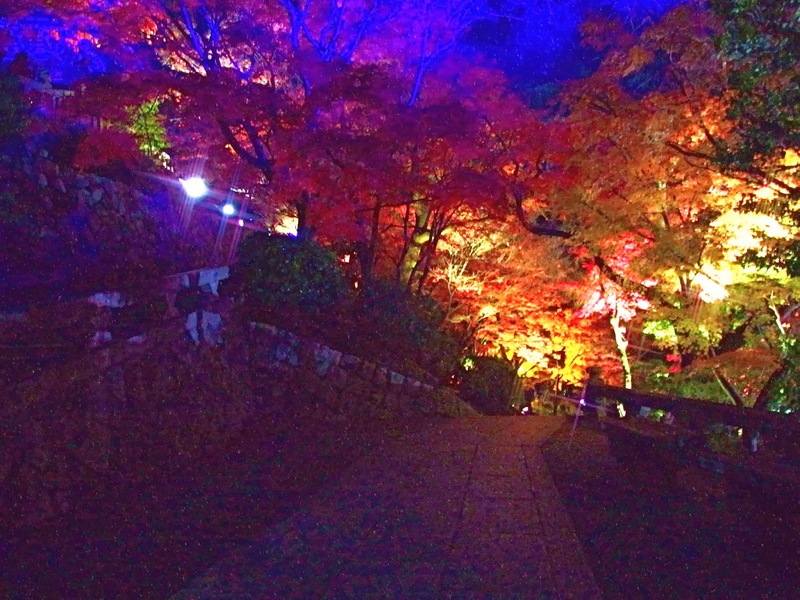 I present to you the main event of our Kyoto Entrees, Kiyomizudera Temple’s Yearly Fall Illuminations!! 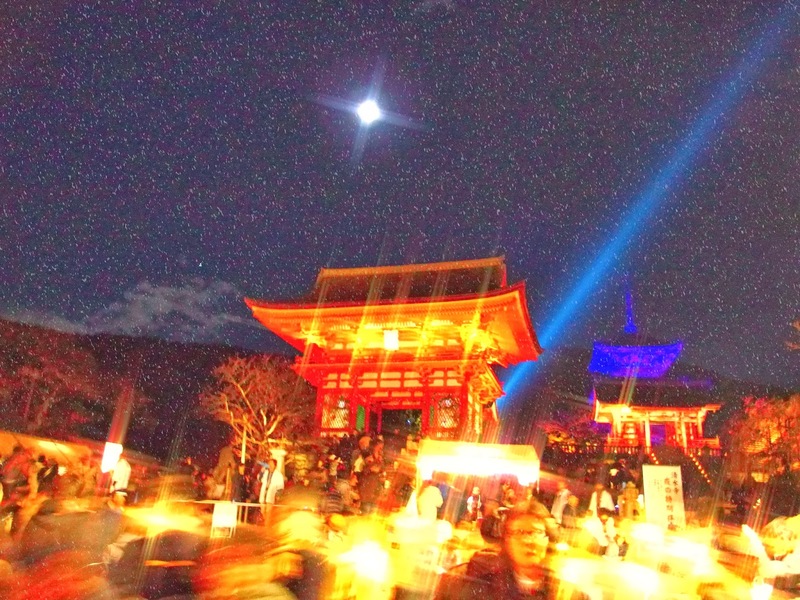 The main gate illuminated magically with the pagoda in the background. And if you look closely, it’s snowing! 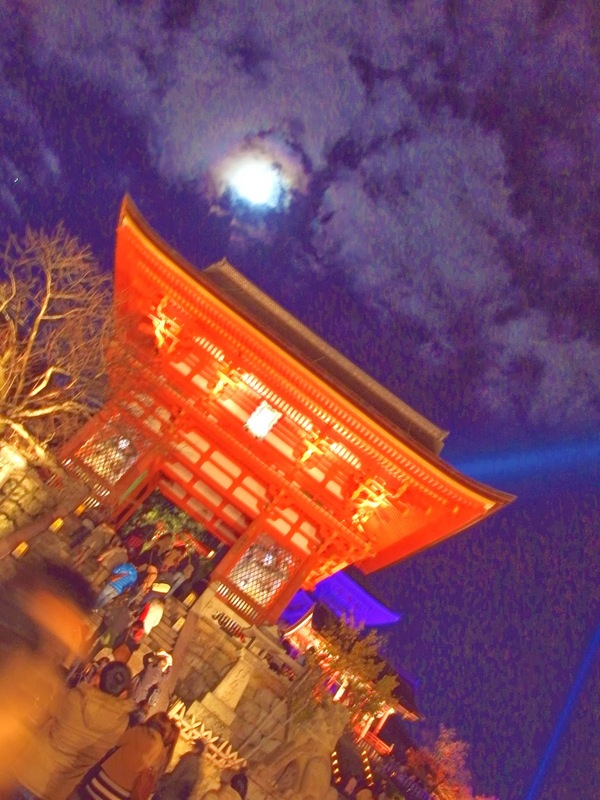 For those who don’t know Kiyomizudera Temple, Kiyomizudera is Kyoto’s most well-known, famous & celebrated temple. 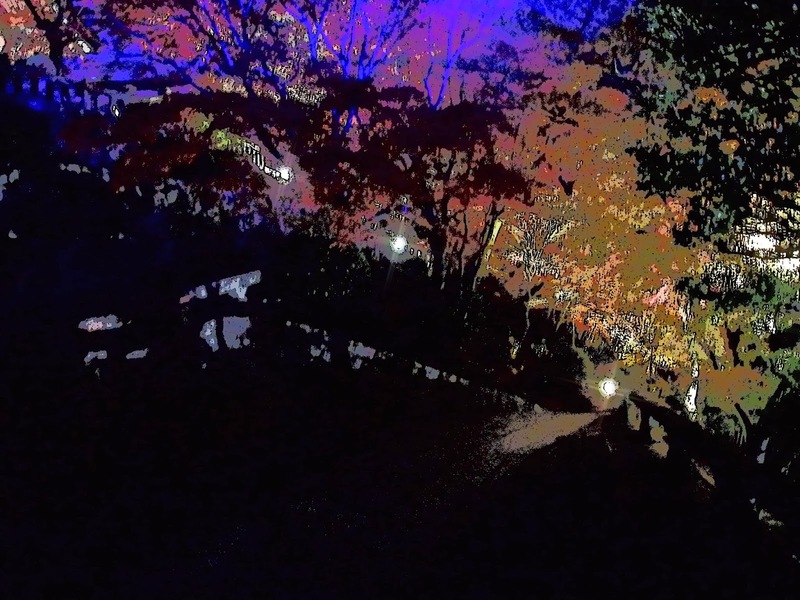 Take a look at my previous visits to Kiyomizudera in the Links below. 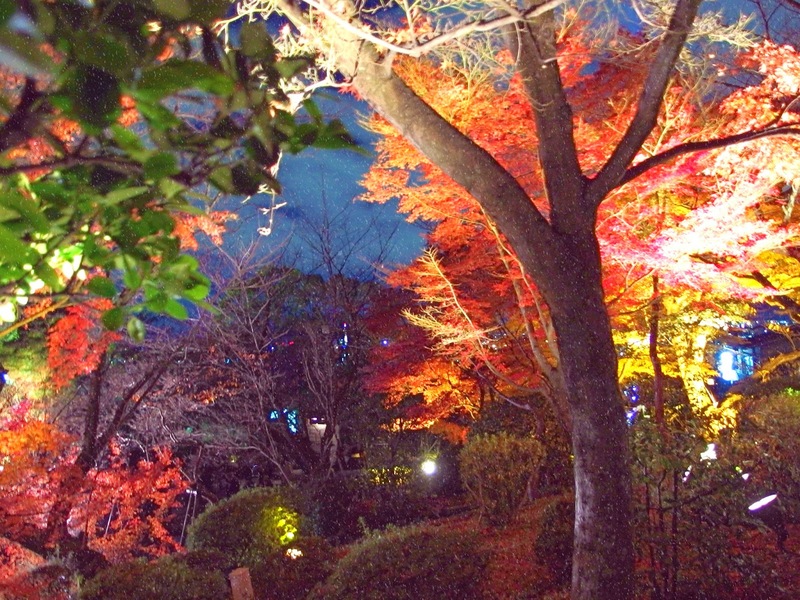 The colors of autumn are truly beautiful, especially when enhanced with well-placed lights! 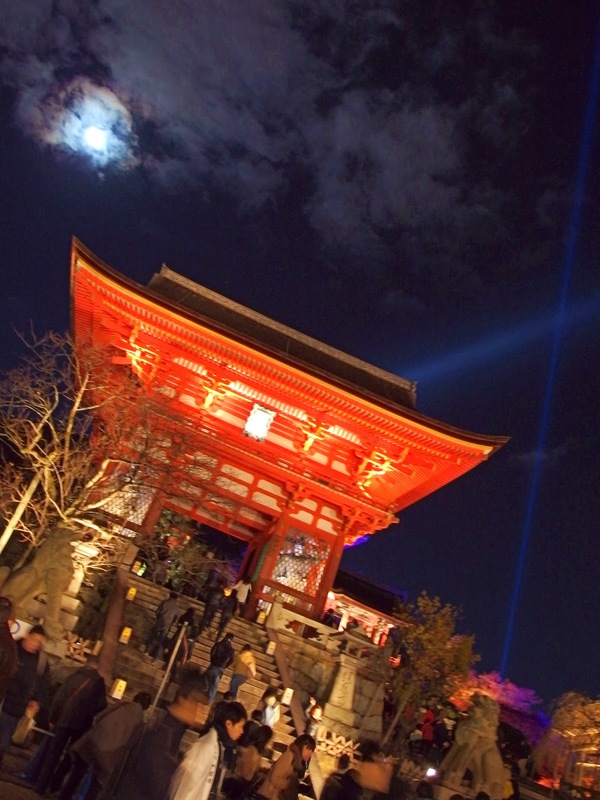 Or, choose to read a short history and details of Kiyomizudera Temple here below. 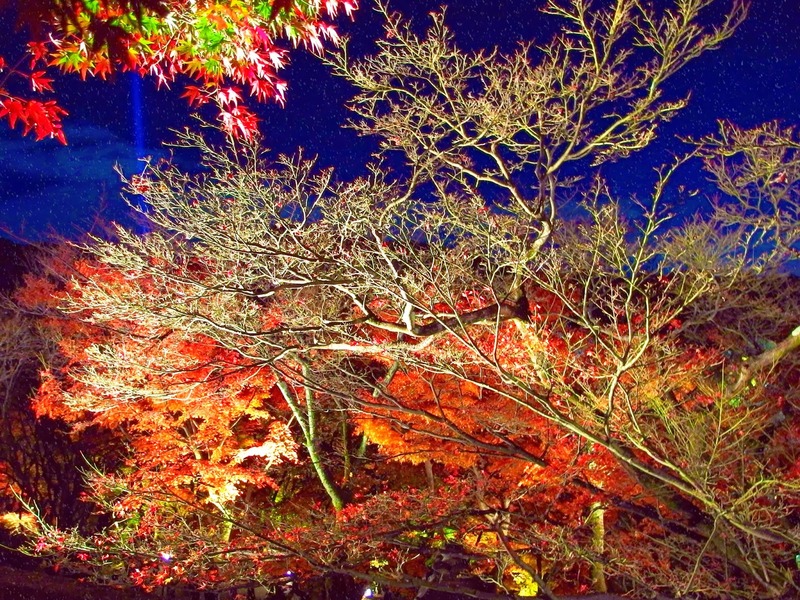 What follows next will be details on the temple’s World-Renowned Fall Illuminations! 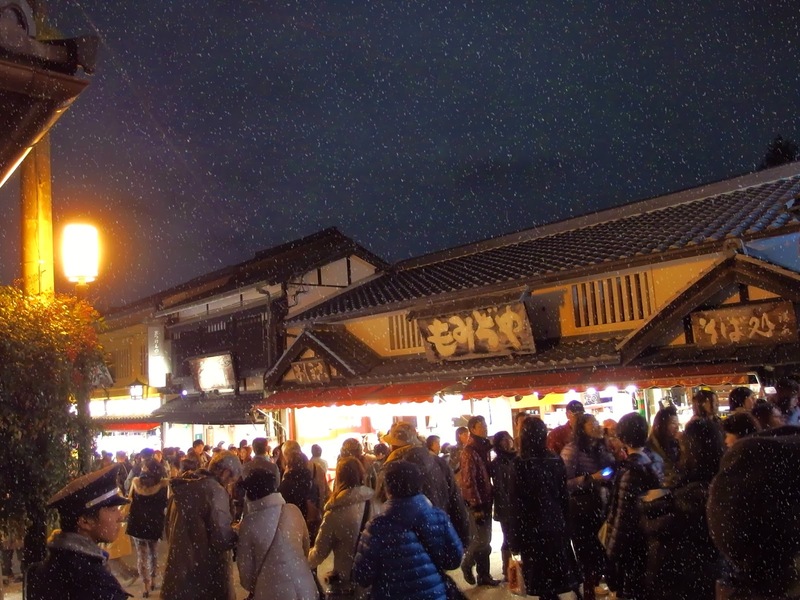 It rarely snows in Kyoto and what’s more, snow fell on this magic night when the temple is lighted beautifully for all to see! 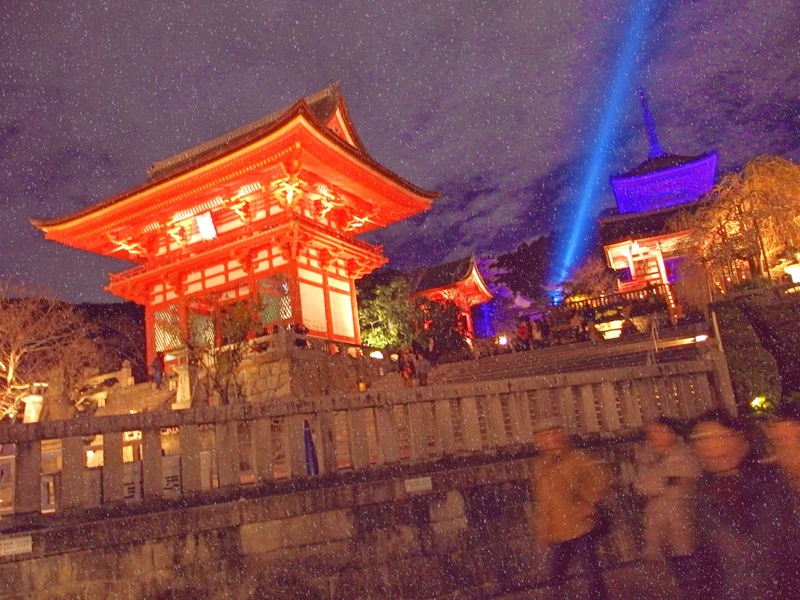 Kiyomizudera literally means: “Pure Water Temple”. 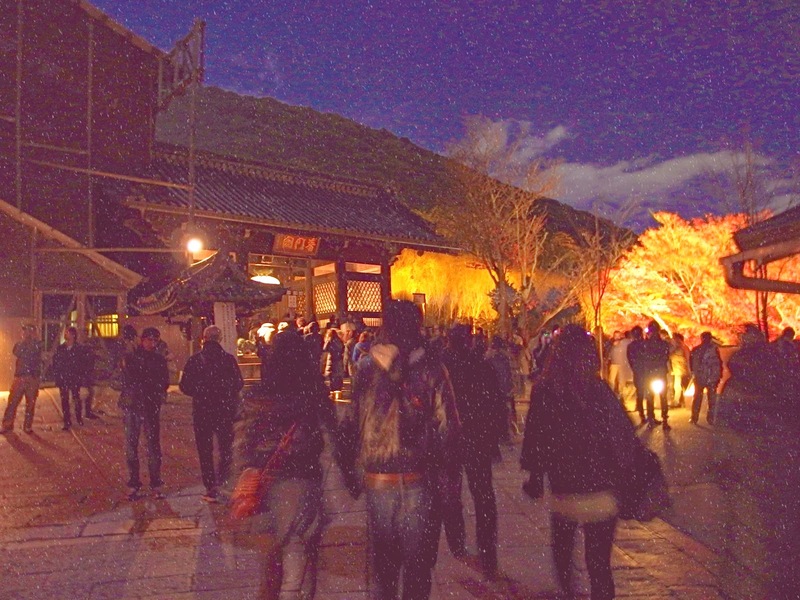 This temple in Kyoto, is Higashiyama-ku’s most famous temple, known throughout Japan for the grand views afforded from its main hall. 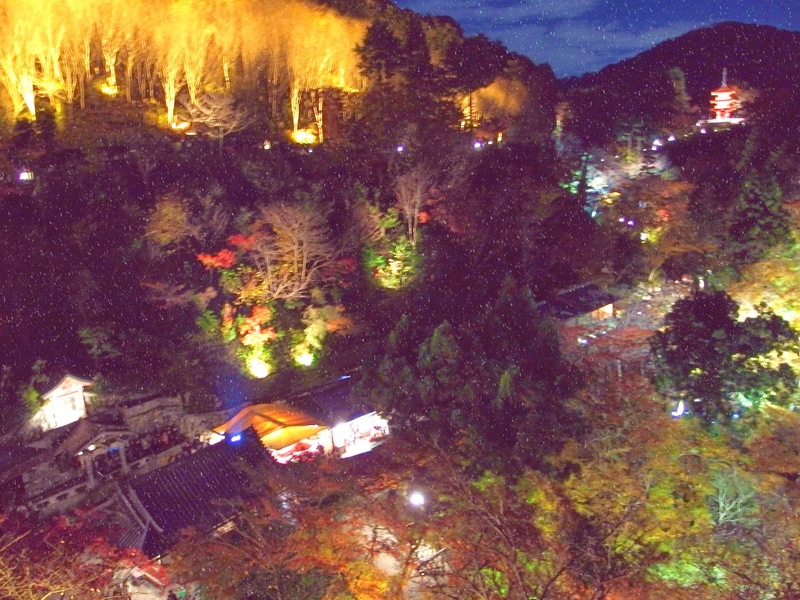 Founded in 798 and rebuilt in 1633 by the third Tokugawa shogun, Iemitsu, the temple occupies an exalted spot on Mount Otowa, with its main hall constructed over a cliff and featuring a large wooden veranda supported by 139 pillars, each 15m or 49ft. high. 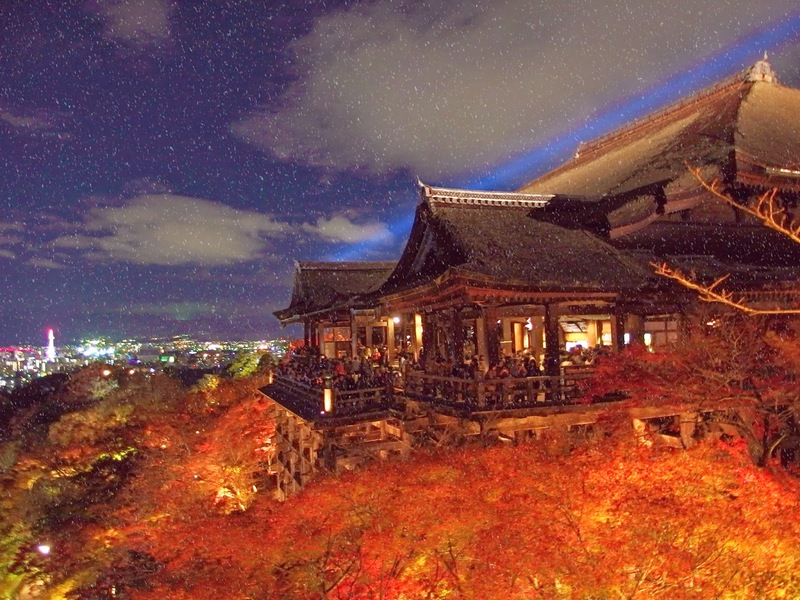 Kiyomizudera is one of the most celebrated temples in all of Japan. 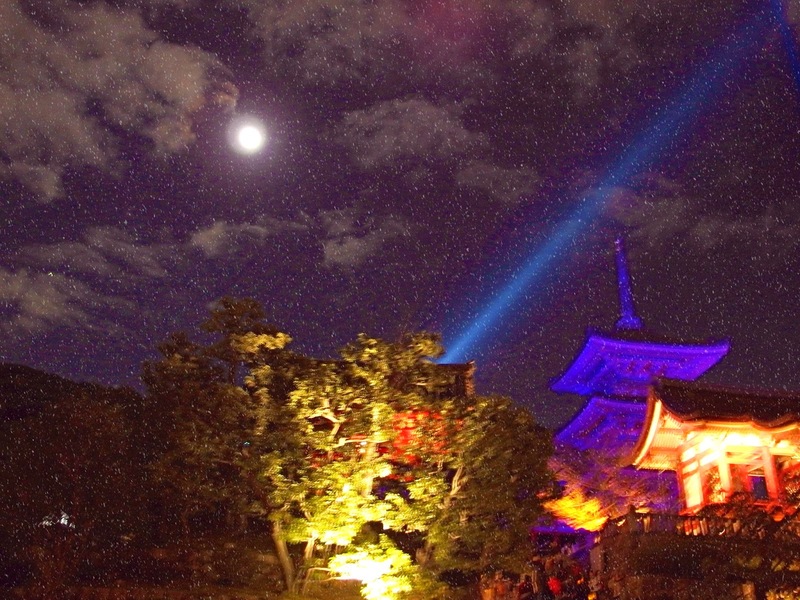 It is a Buddhist temple built during the Heian era on an impressive floating platform. What’s even more impressive, is that not a single nail was used in the entire structure! 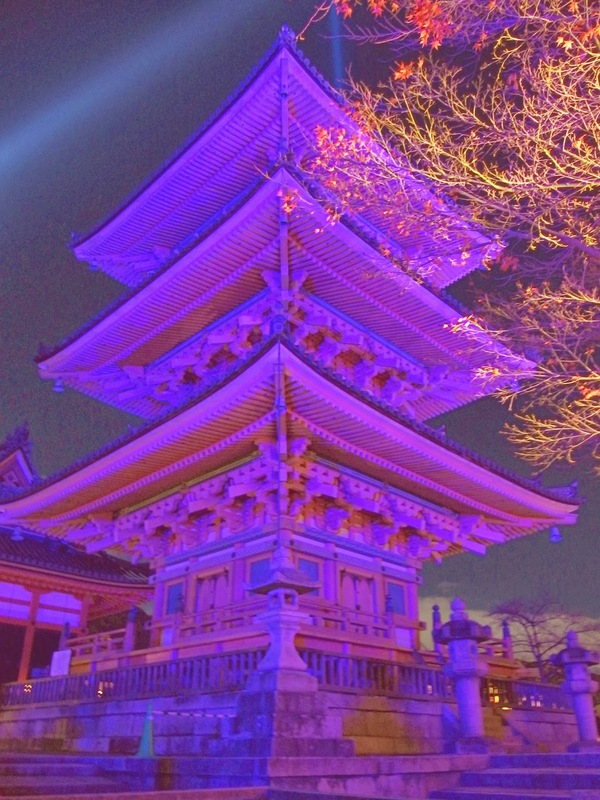 The main hall is dedicated to the goddess of mercy and compassion, but most visitors come for the magnificence of its height and view, which are so well known to Japanese that the idiom “jumping from the veranda of Kiyomizu Temple” means that they’re about to undertake some particularly bold or daring adventure. 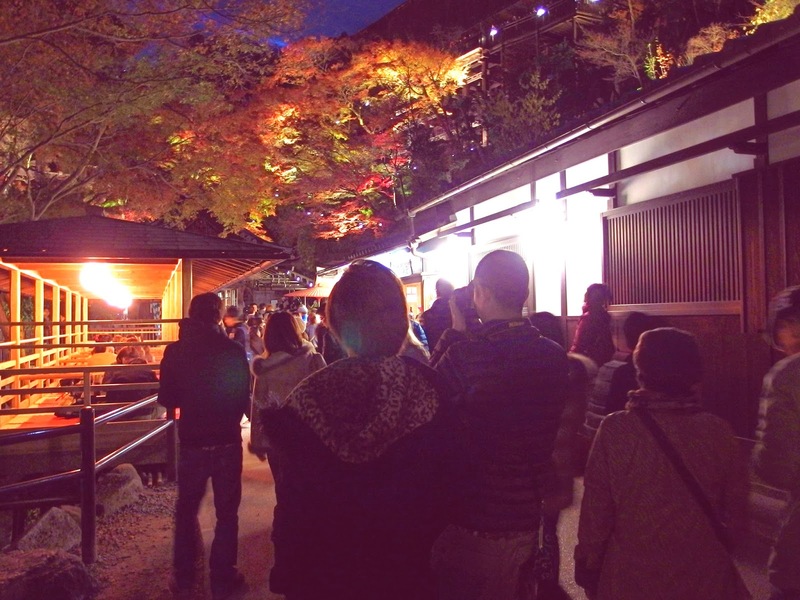 Kiyomizudera’s grounds are particularly spectacular and crowded in spring during cherry-blossom season and as in this entry; in fall during the turning of the maple leaves. 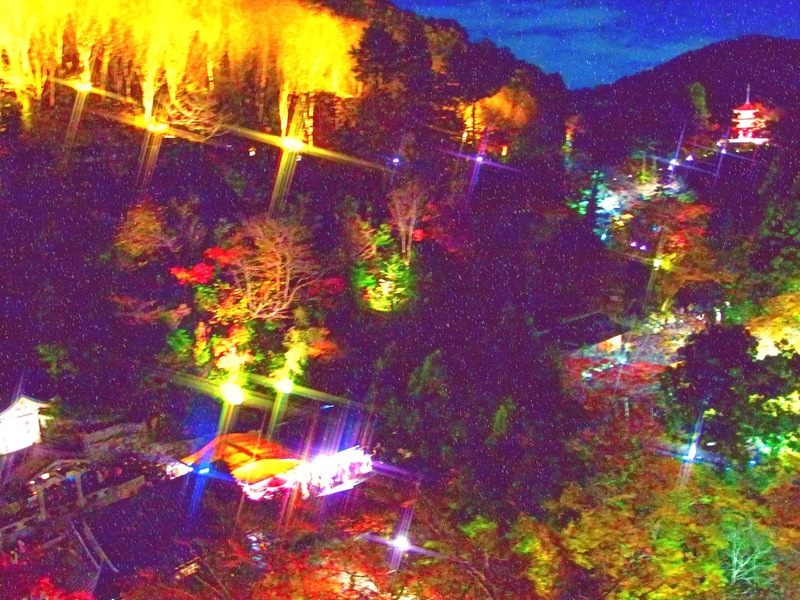 From the wooden veranda, you’ll see the Otawa Falls, down below. 3 streams for you to drink from, each grants a different blessing. 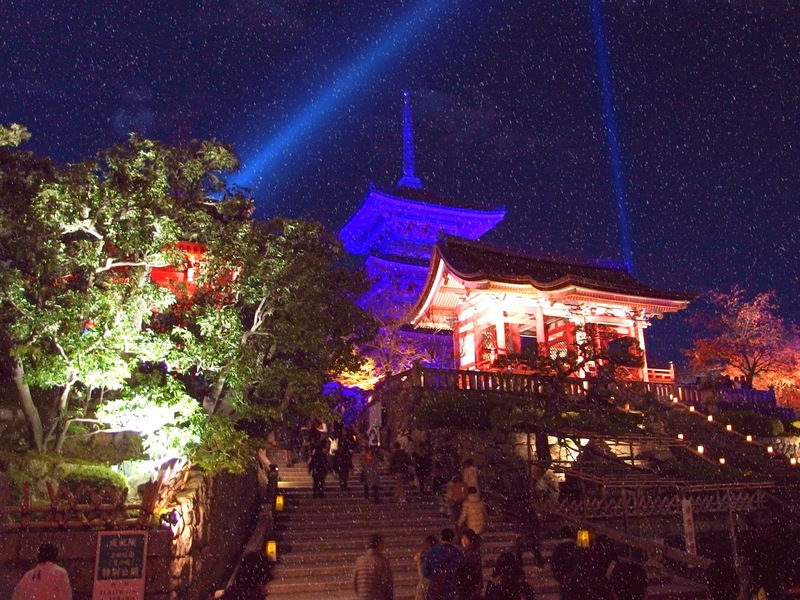 Also in Kiyomizu Temple compounds are the three-story pagoda and Otowa Falls, which are known for the purity of its water; Kiyomizu translates as “Pure Water”, as mentioned above. 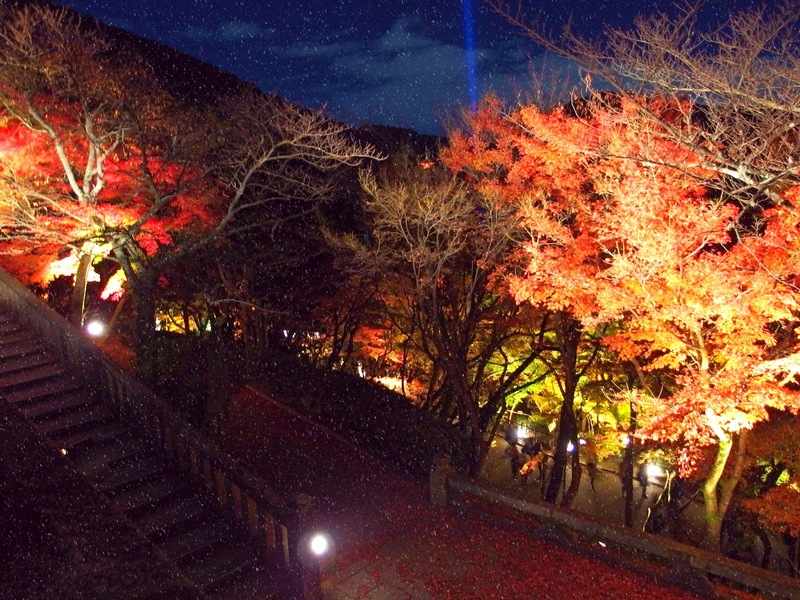 Here, be sure not to spite the gods by neglecting to visit Jishu Shrine, a vermilion-colored Shinto shrine behind the Kiyomizudera main hall that has long been considered the dwelling place of the god of love and matchmaking. 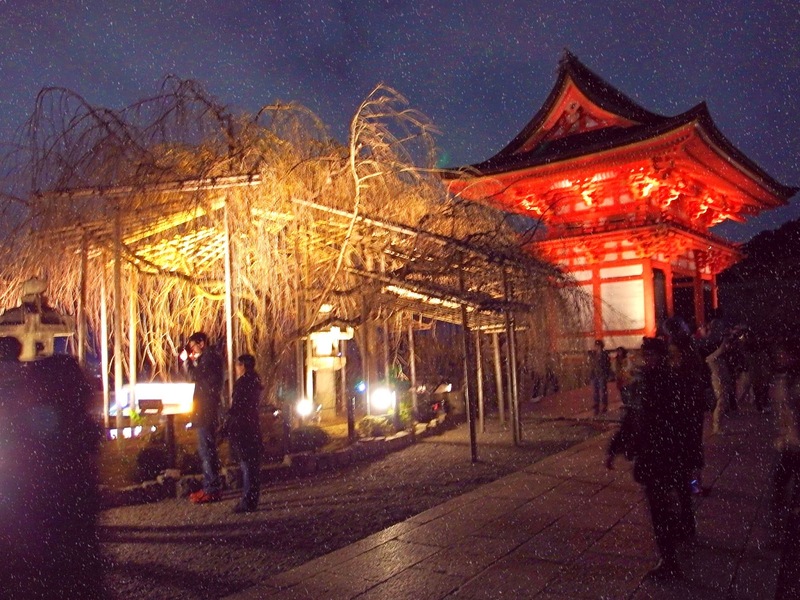 Be sure to take the ultimate test of love: On the shrine’s grounds are two “love fortune telling” stones placed 9m apart; if you’re able to walk from one to the other with your eyes closed, your desires for love will be granted. Trust me when I say my pictures do NOT do the place justice at all! 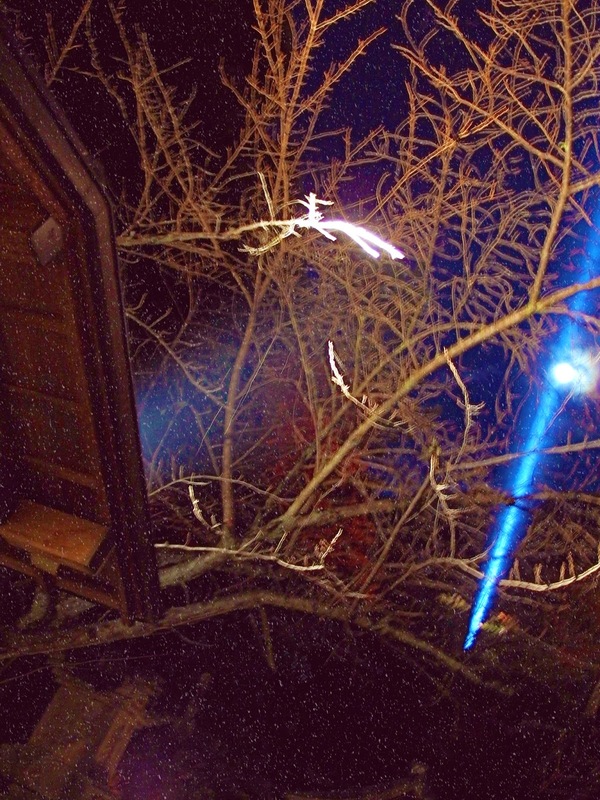 No words can describe the sorcery of this night. 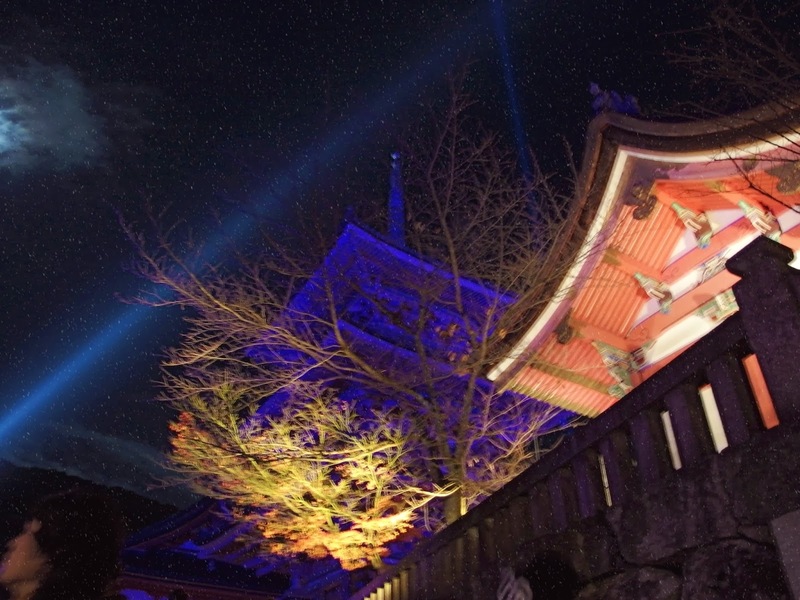 Try visiting Kiyomizu Temple when it’s illuminated, you won’t regret it! 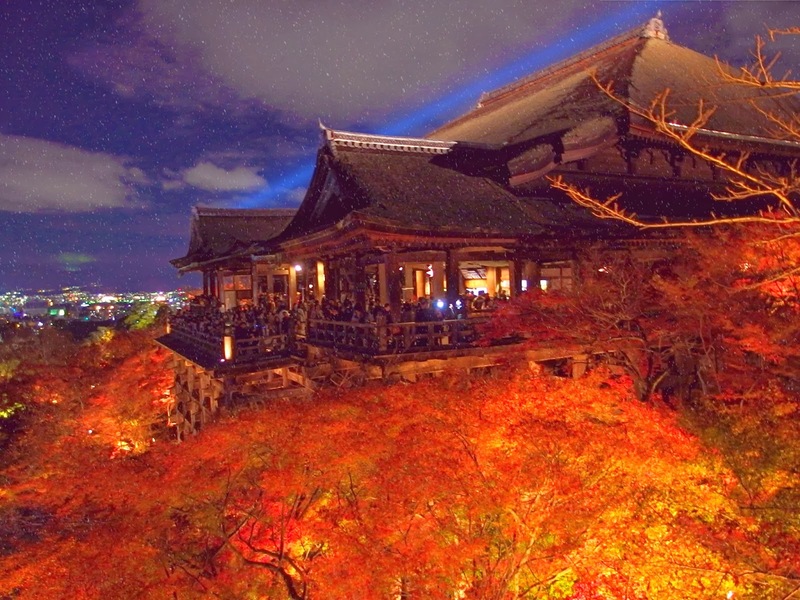 Kiyomizudera temple, a World Heritage site in Kyoto’s Higashiyama Ward, is bathed in an ethereal glow every autumn, on a few days each year, in celebration for its annual autumn night viewings. 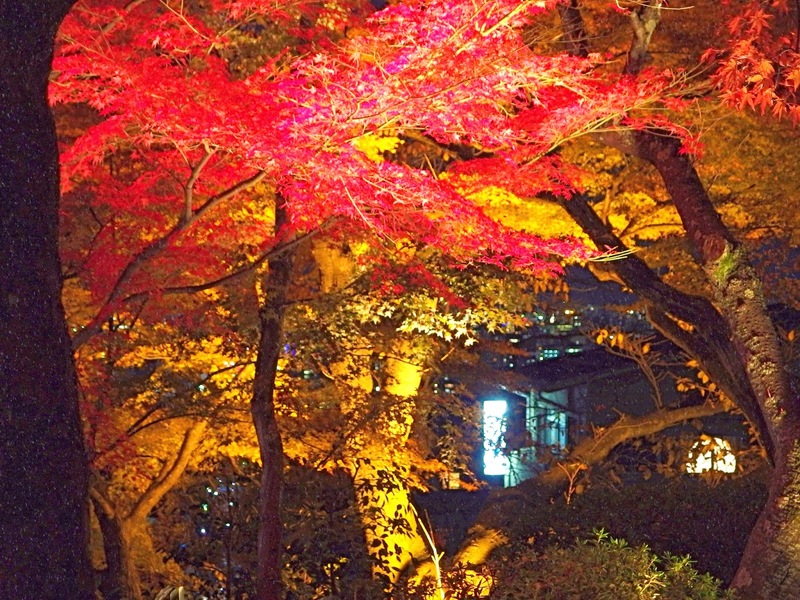 As autumn is finally upon us, many trees will finally begin turning their beautiful red color, known as momiji. 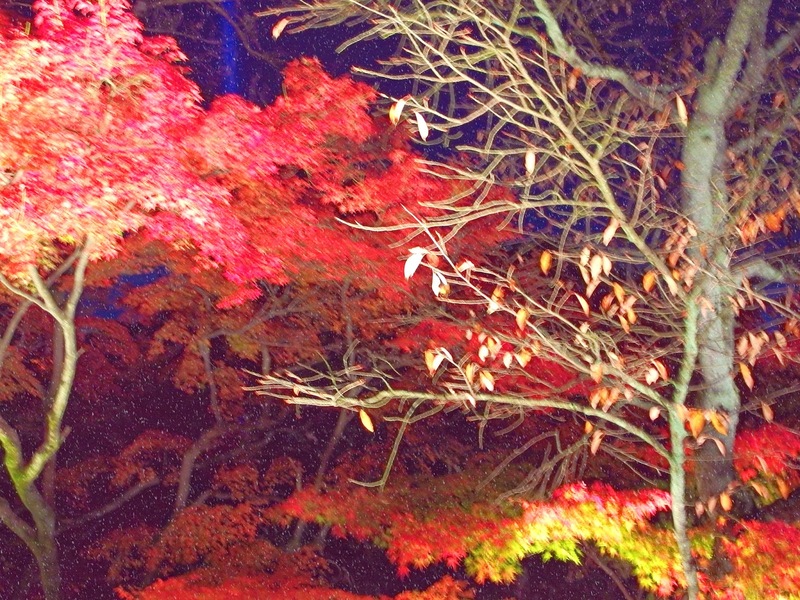 Once the trees begin to turn, you’ll find that many Japanese people like to take part in momijigari, meaning; “red leaf hunting”. 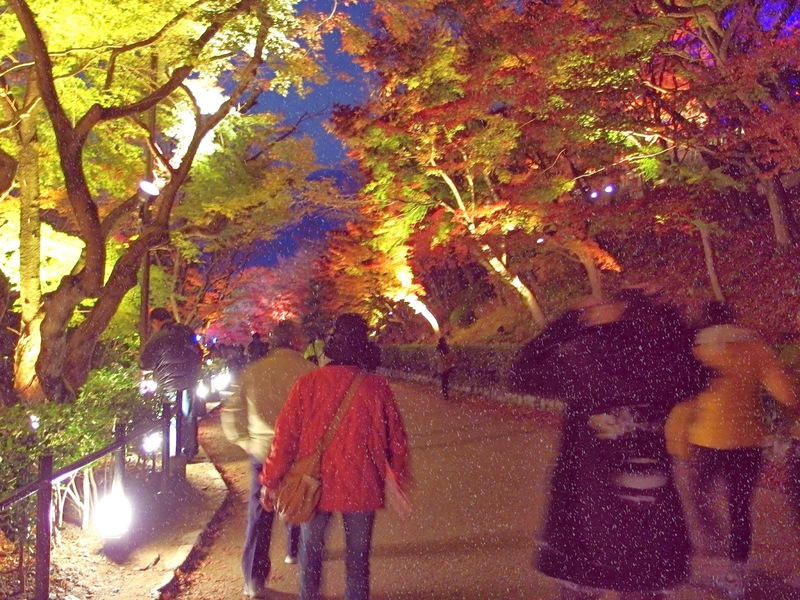 People will travel to scenic locations where leaves have begun to turn red, similar to what they do in the spring for cherry blossoms. 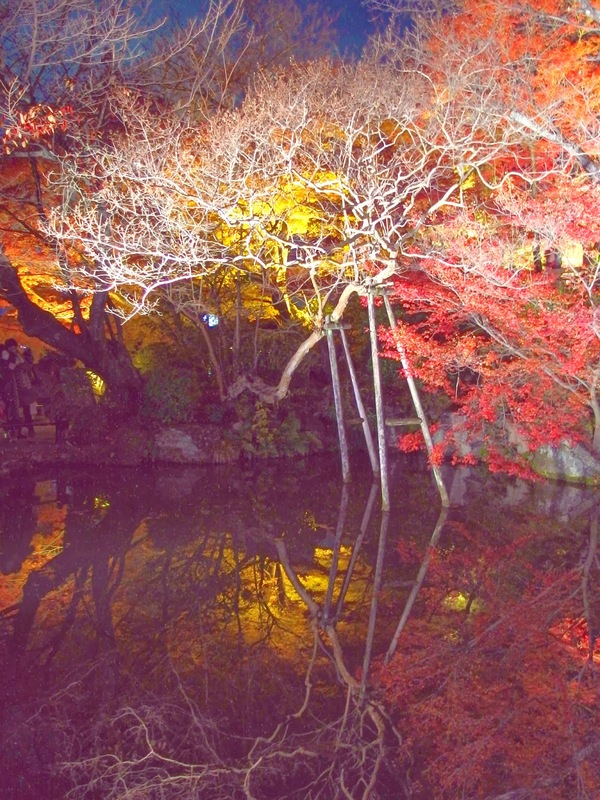 One of the most popular locations to visit for fall colors is Kyoto, which is where this tradition is said to have begun. You have to see it, to believe it! 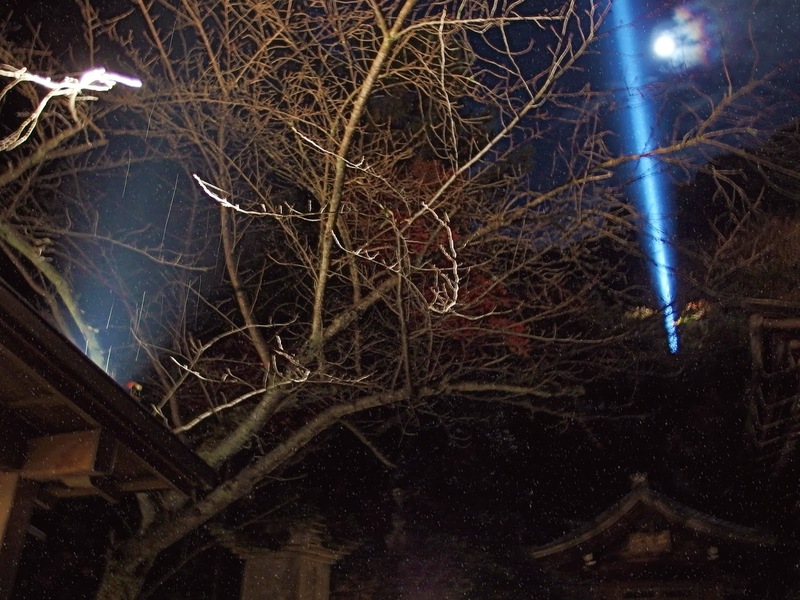 During momiji time, it is also popular to hold temple illuminations. 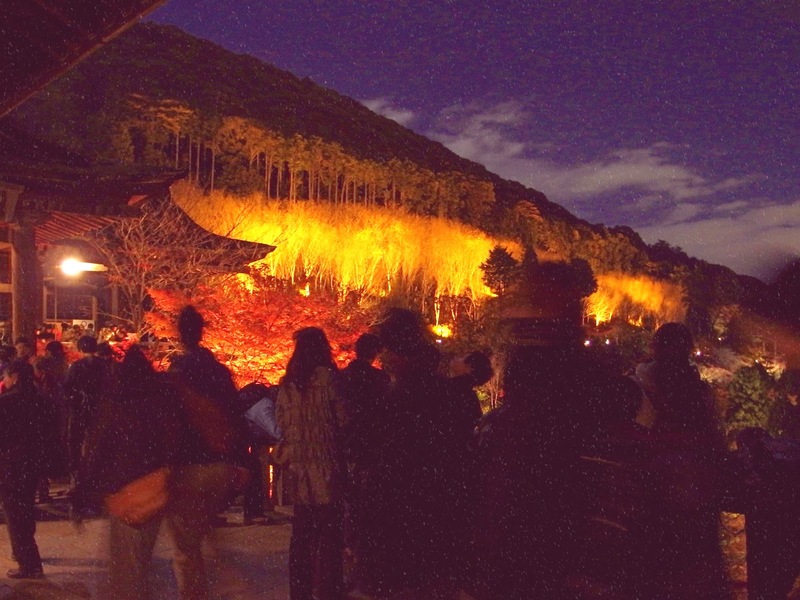 The most famous of all illuminations being held at Kiyomizudera. 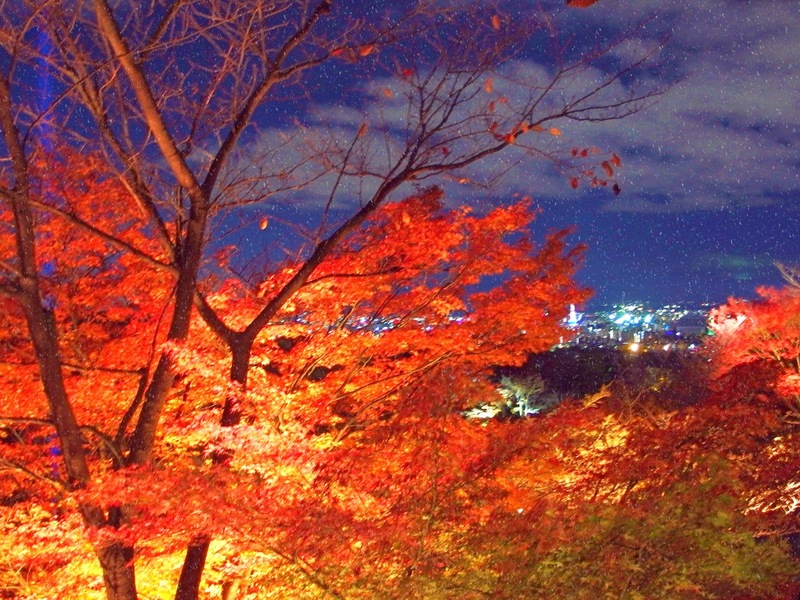 As autumn reaches full swing, Kiyomizudera appears to be held in the embrace of the vivid autumn foliage. 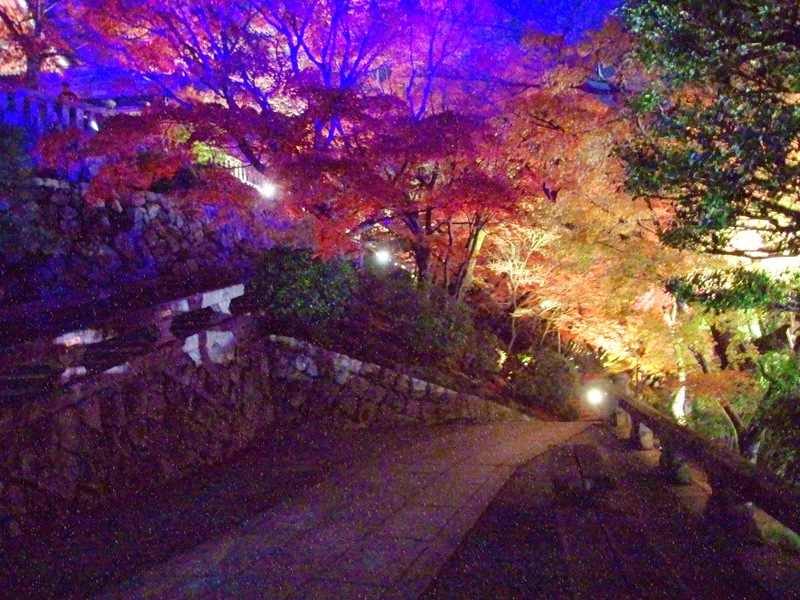 During this period in which the temple is given this beautiful splash of color, a special night time illumination is held within the grounds. This is one of the rare times I’ve experienced snow during autumn! 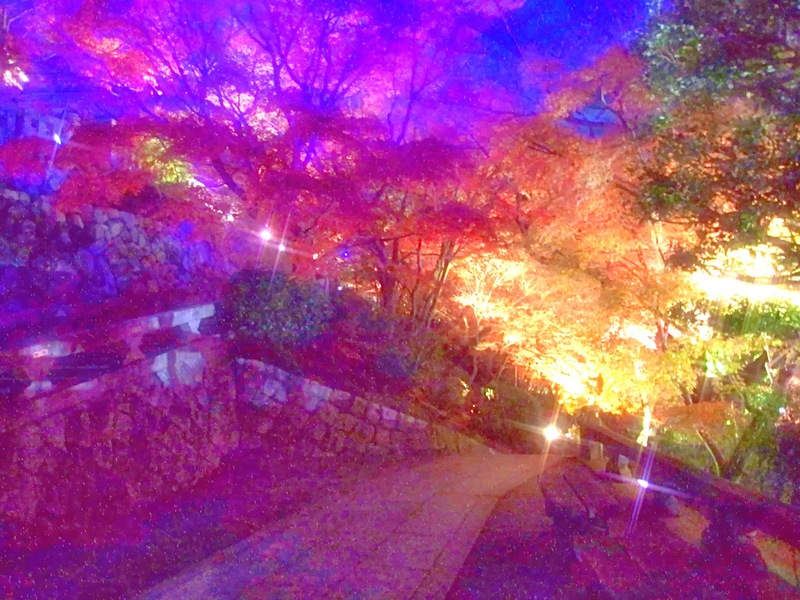 Flooded with light and color, the temple grounds reveal to visitors a beauty that cannot be seen anywhere else. 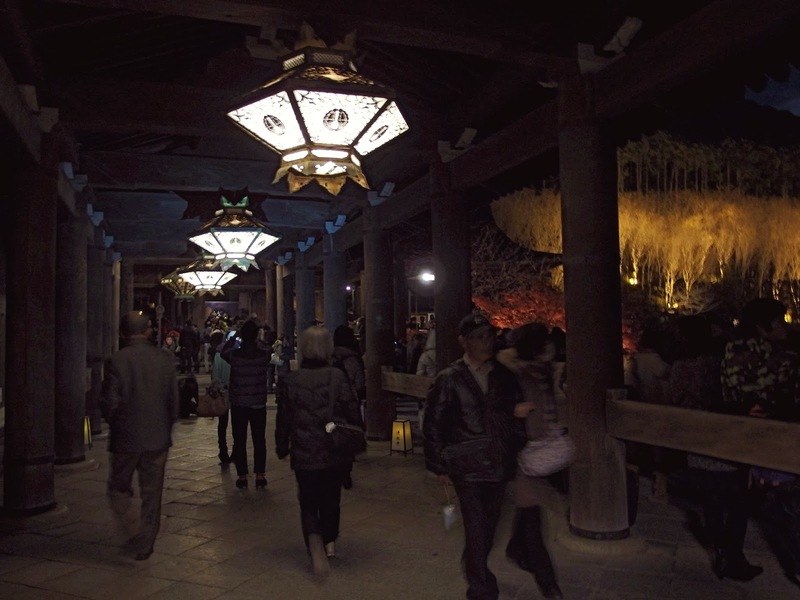 Hundreds of light bulbs illuminated the tall wooden pillars and beams of Kiyomizu Temple’s veranda, which also is a designated national treasure, as well as the roughly 1,000 maple trees in and all around the complex. 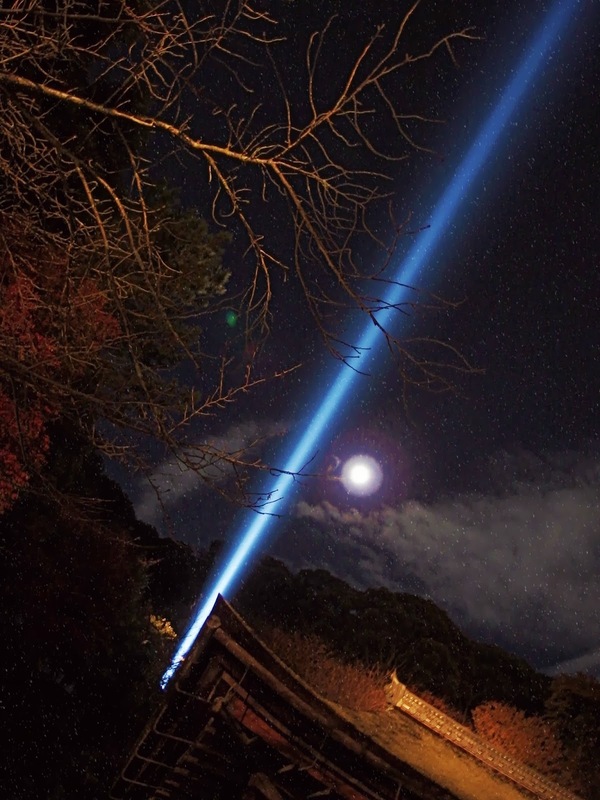 A blue light beam, representing the mercy of the Buddhist deity Kannon, who is the Goddess of Mercy – extended west in the sky, toward the city center. 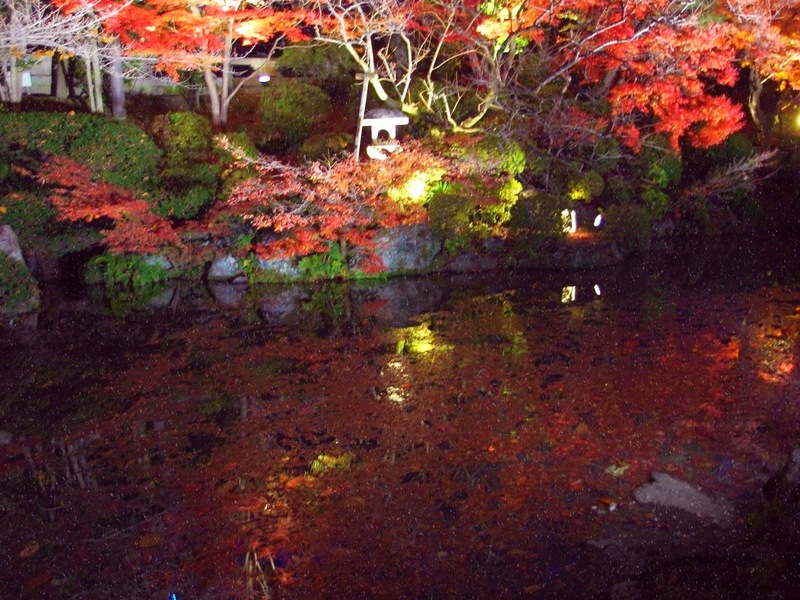 Built in the early Edo period, Joju-in Teien is a famous garden that features an ornamental pond and ‘borrowed’ scenery. 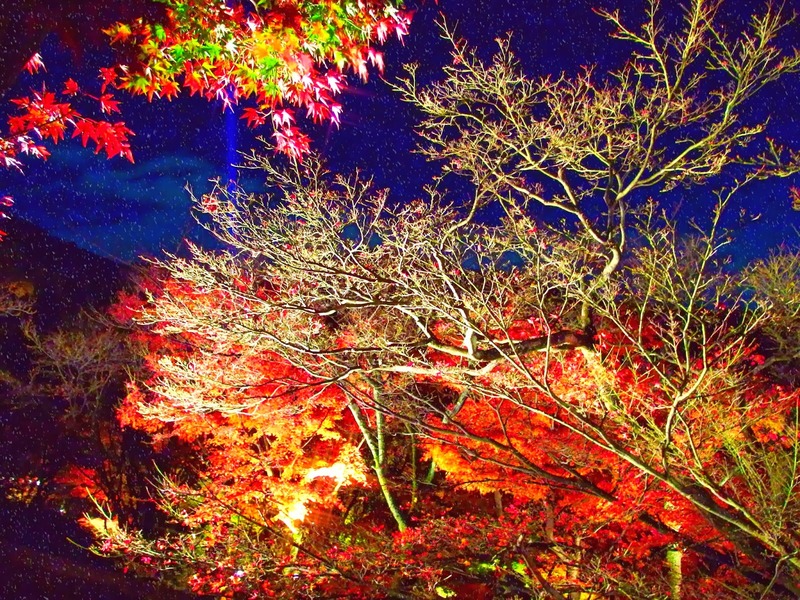 On your visit, be sure not to miss the “Moon Garden”, Joju-in Teien, which is a beautiful pond and garden and specially opened to the public, only during this period. It’s not only the temple halls that will be illuminated. Red leaves around the grounds and other fall colors will also be showcased. 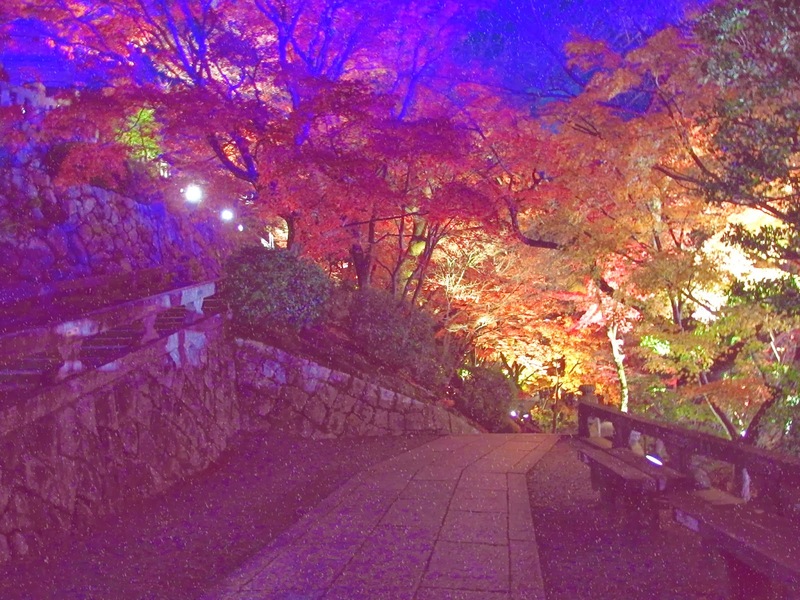 Flooded with light and color, many of the temple halls will be illuminated. 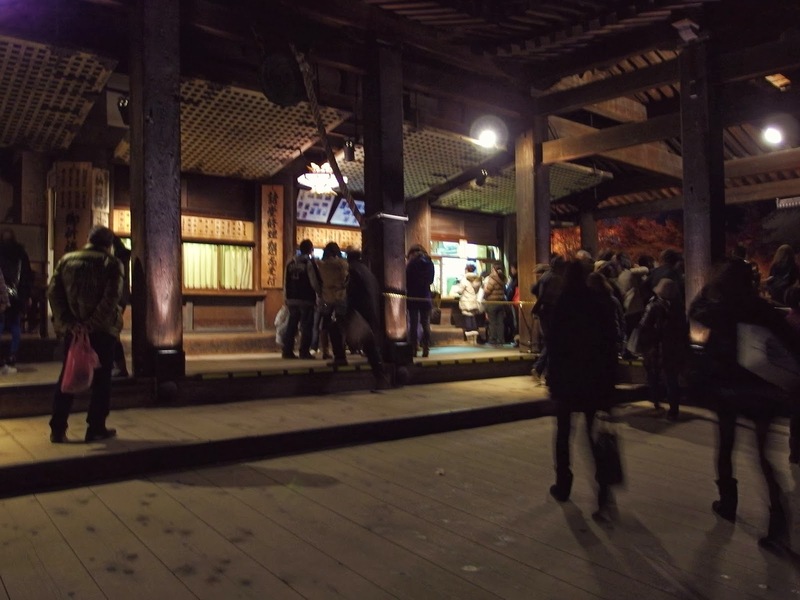 As you make your way around the temple grounds, stop to admire each of the buildings. 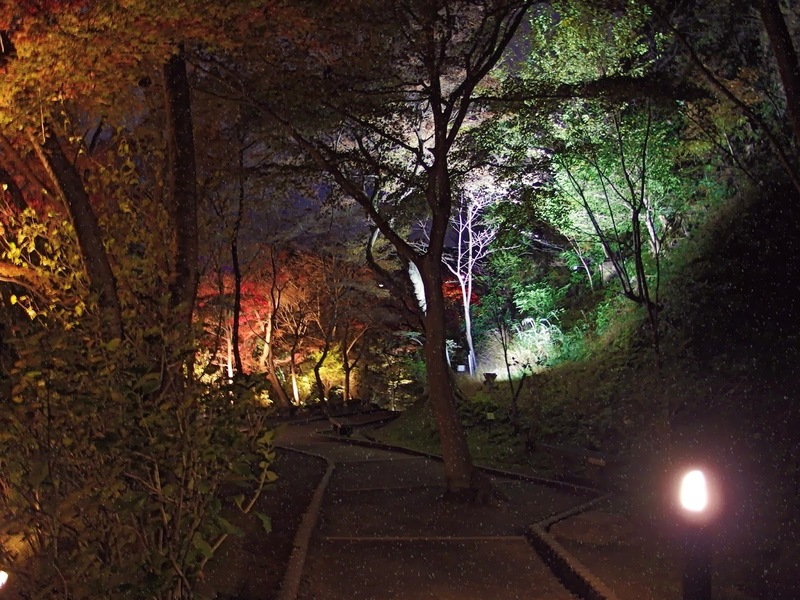 The illuminations make them look even more intricate and it gives visitors a truly beautiful experience that cannot be seen elsewhere. 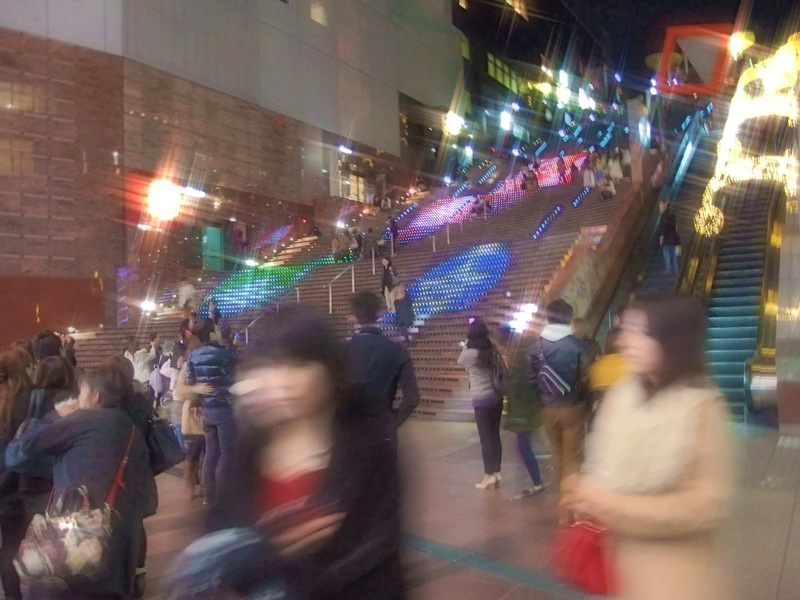 It’s unavoidable, photo taking is definitely something everyone will have to do! 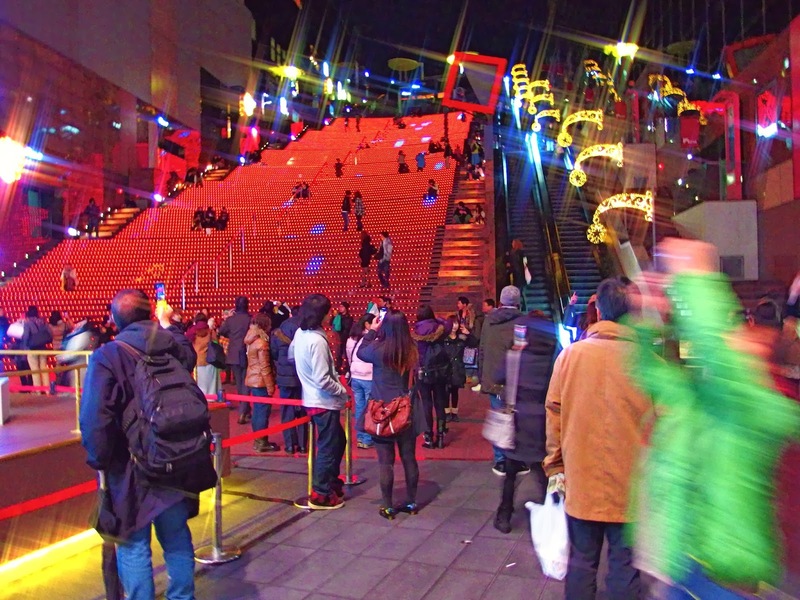 Especially with the crowds, don’t expect to quickly walk through all of the structures. 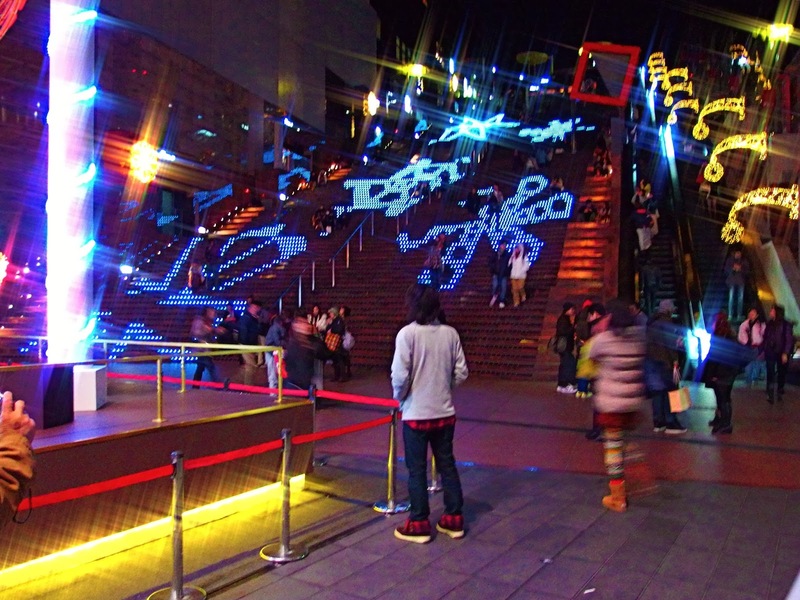 Many people will spend time taking photos, which will really slow down the foot traffic. However, don’t worry too much about that, as you’ll likely be doing the same thing! 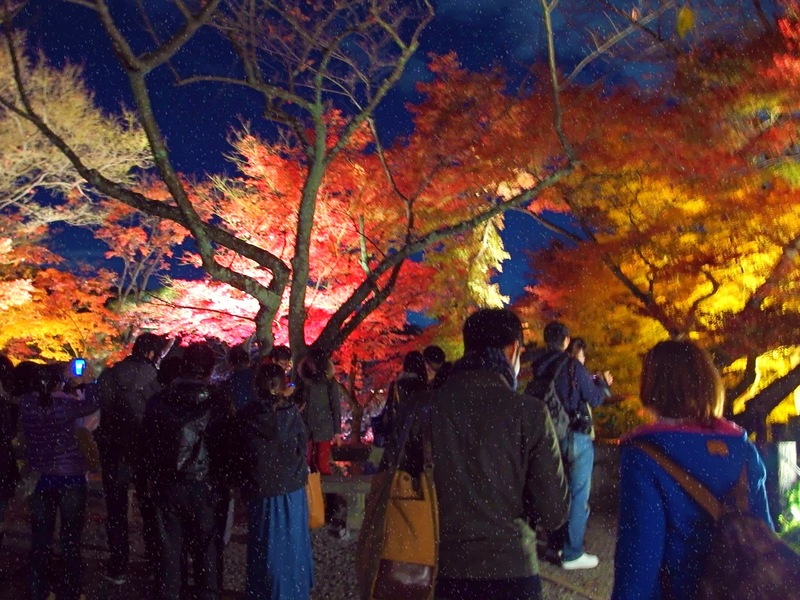 If you’ll be visiting Japan this fall, make sure to add this unique experience to your itinerary! 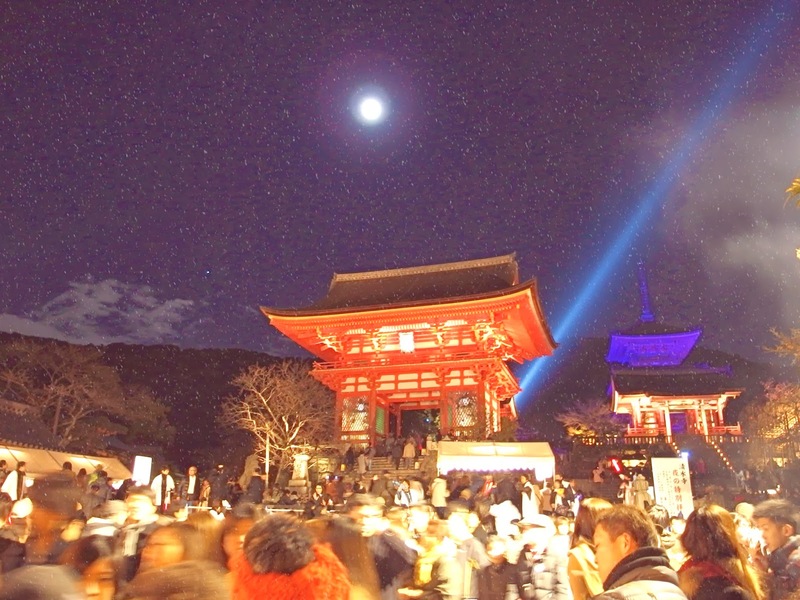 Kiyomizu Temple does NOT light up every night! 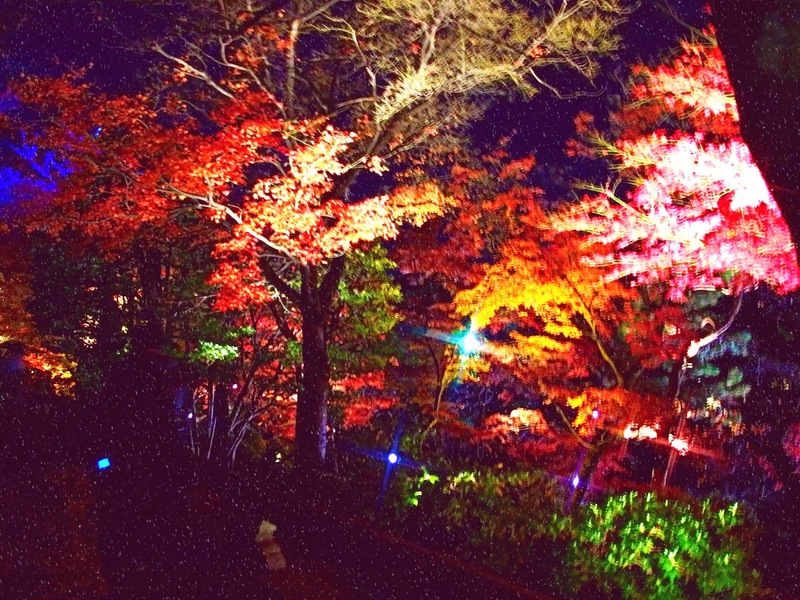 To see the illuminations, you have to check for the rare few days when it lights up during spring/autumn! And by the time you read this, it might already be in your bag…. 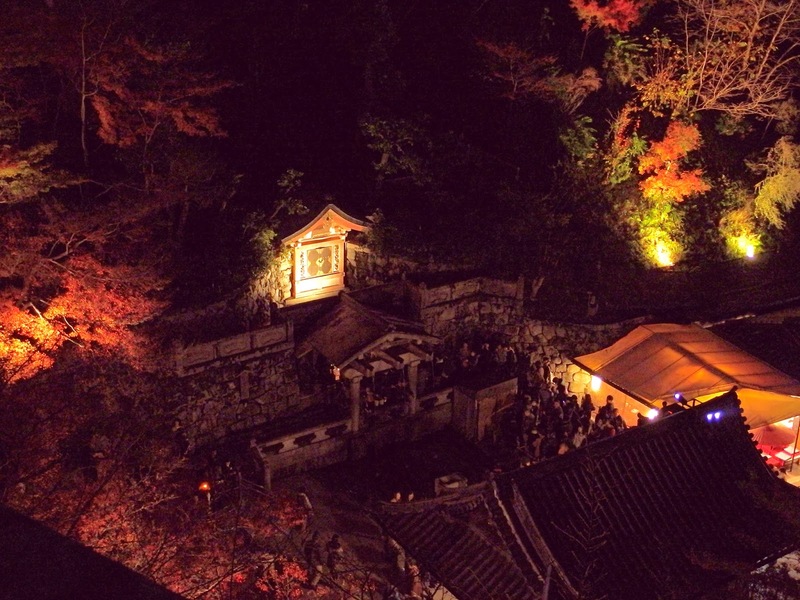 From Mid-November until Mid-December, illuminations are held each year on certain nights only, at Kiyomizudera from 6:30-9:30pm. 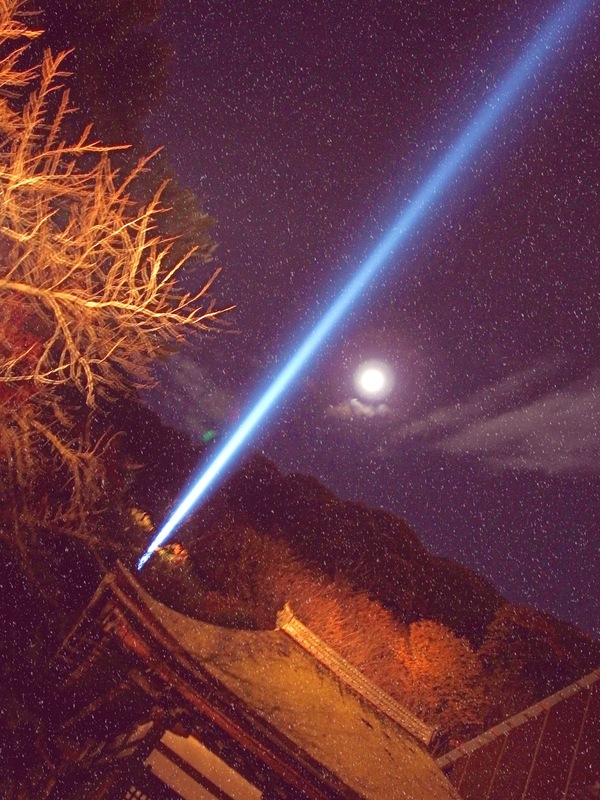 “Mercy”, the blue beam that revealed the first signs of snow to everyone! Make sure you come a bit earlier than this to prepare for large crowds and long lines leading up the hill to the temple during this time. 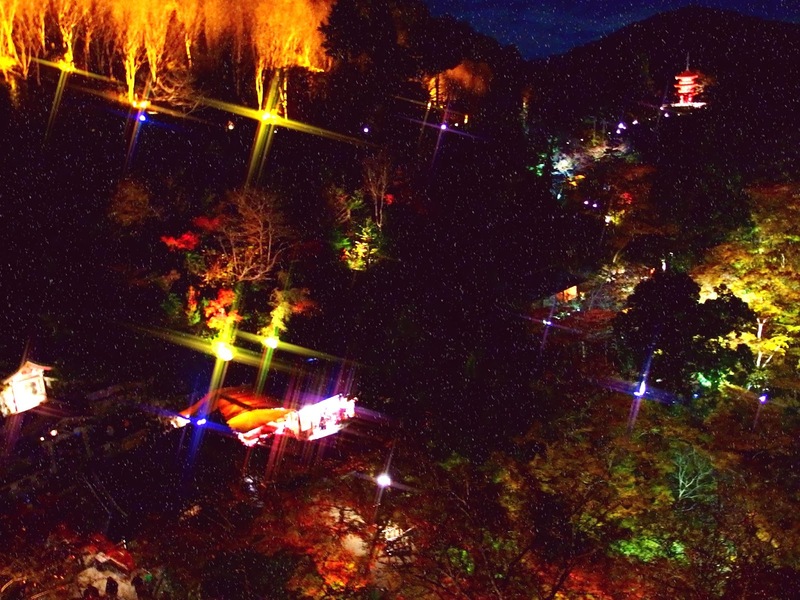 There is a 400 yen admission fee, but it is well worth it to see this impressive temple lit up. 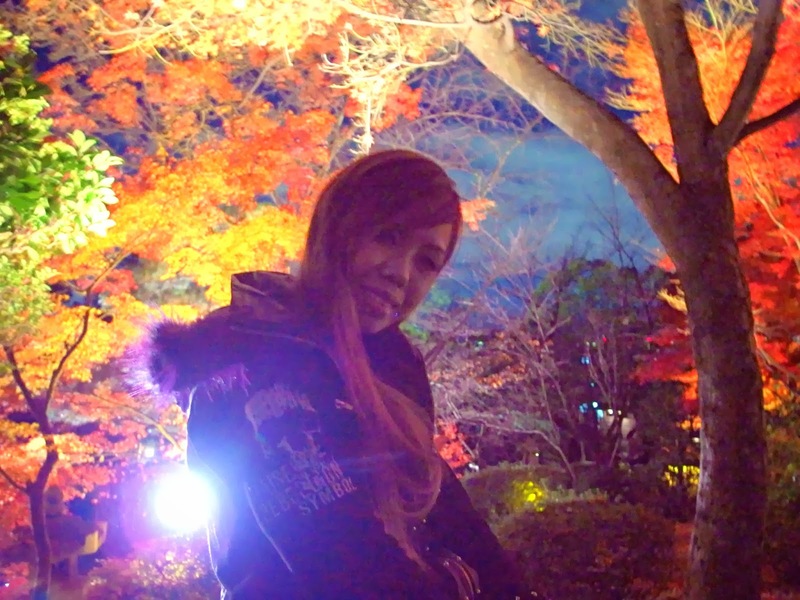 Here’s a Link to our previous visits around Kyoto, feel free to Click! After the magic was over, we headed over to the many traditional shophouses to purchase souvenirs for friends, family and other loved ones. Sat down for some evening tea and light snacks, too! Hot noodles like Udon, taste great during cold nights! 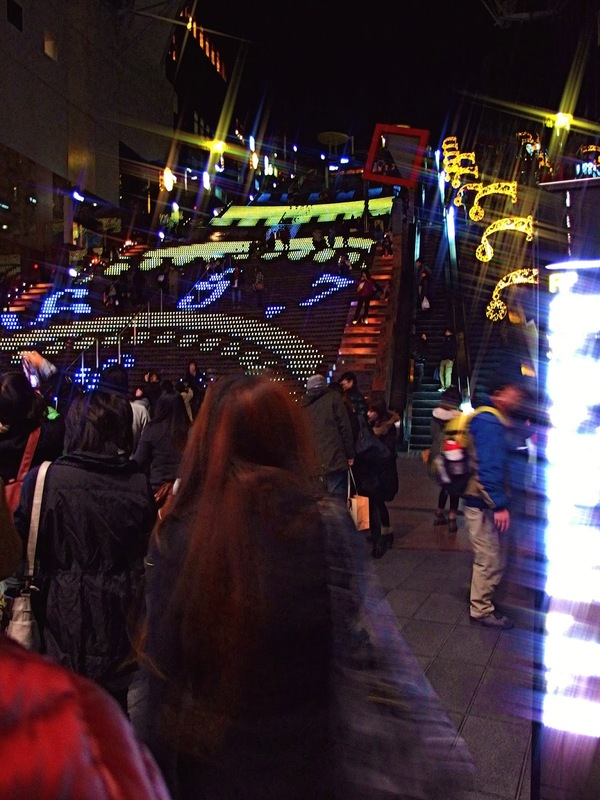 Strolled around, and mingled with the crowds while taking in the lovely festive air. 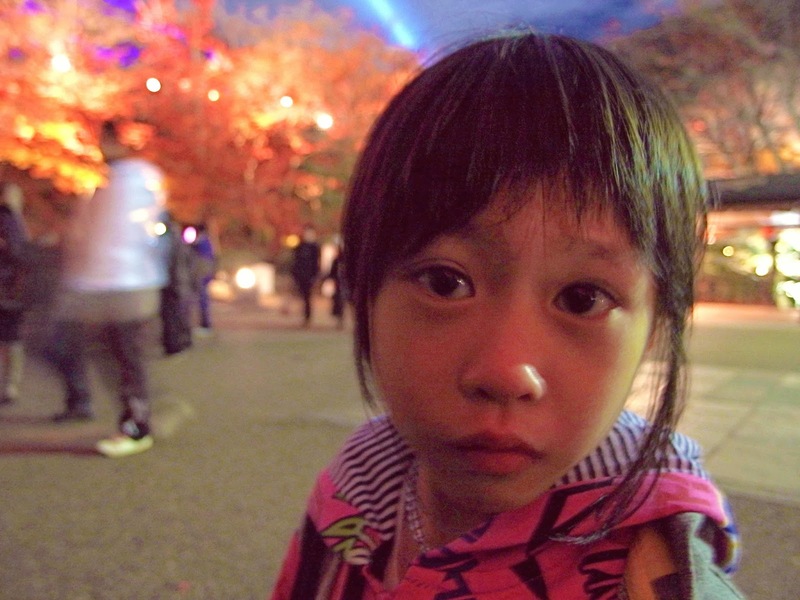 We were even offered deliciously warm green-tea by a kind old lady. I suppose that cup of green-tea woke her up! In fact, everyone was offered as many cups of love, by this old kind soul. For those who do not live in Japan, don’t be alarmed as this is nothing rare. 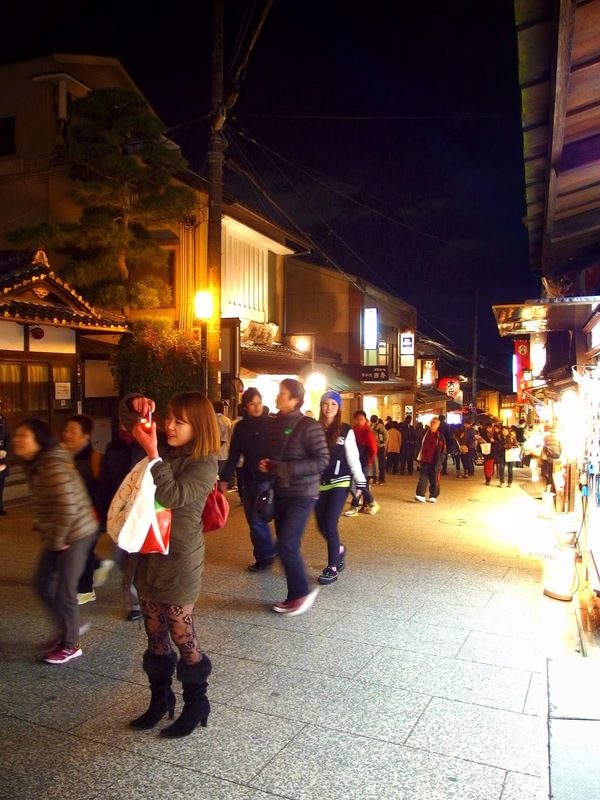 Many Japanese do these things, for goodwill with no personal gain at all! 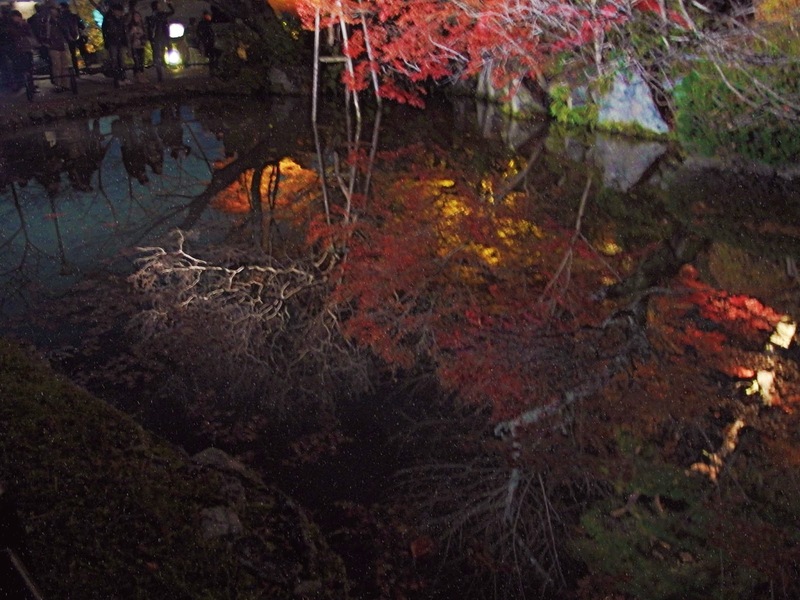 If you truly enjoyed this blog post and probably already planning your next trip to Kyoto, please let me recommend you another place similar to Kyoto. 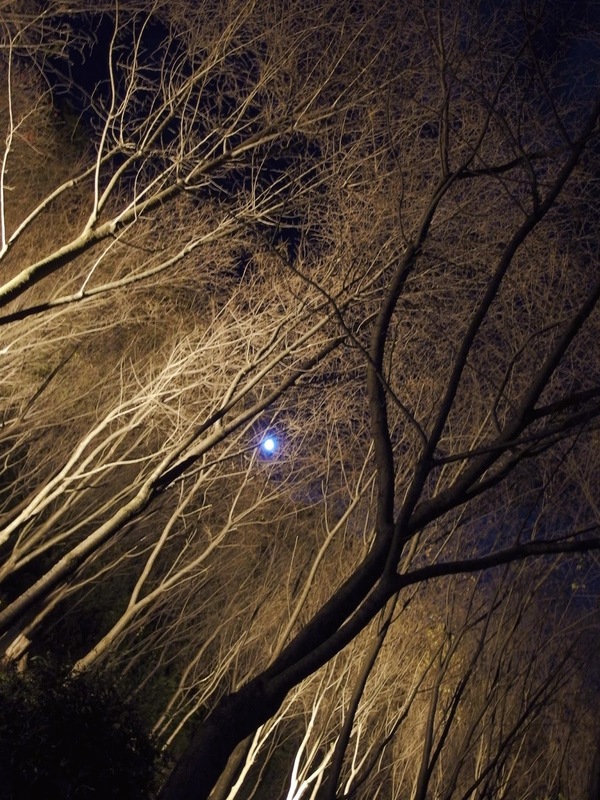 Have you heard of Nara?? 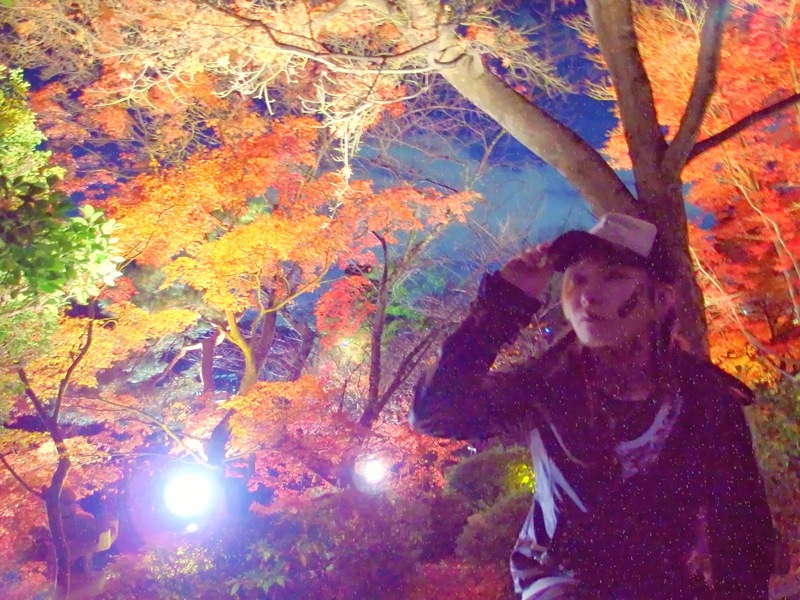 Please feel free to check these Links out on Nara, below! 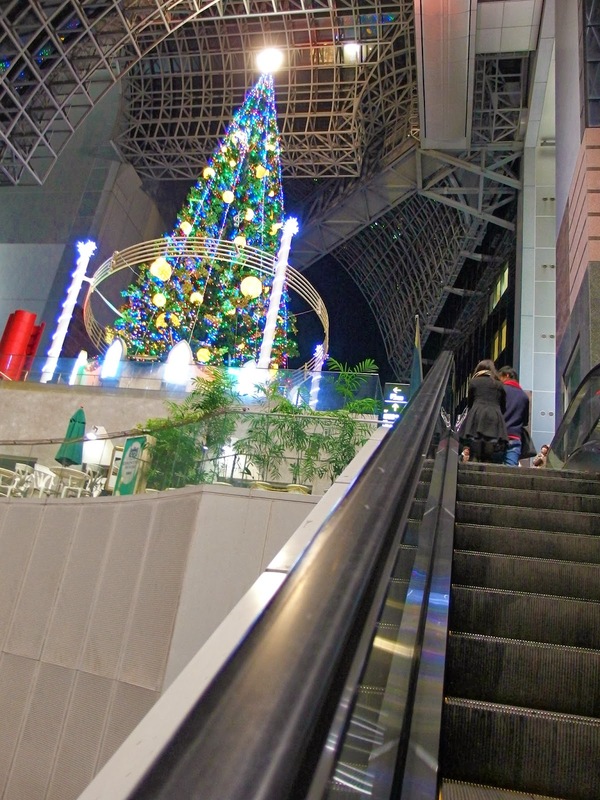 We eventually made our way back to Kyoto Station to catch out train back to Osaka. 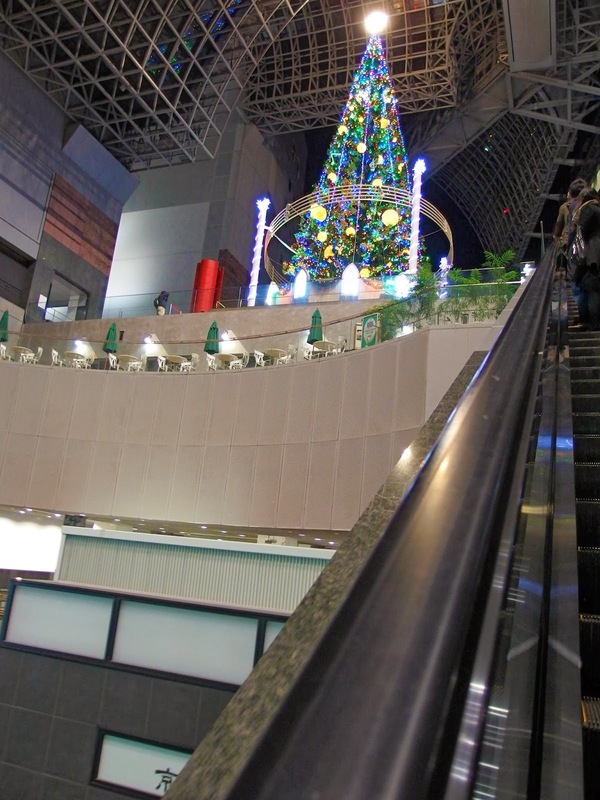 From top to bottom, every inch was set up with Christmas decorations and lights, including the entire flight of stairs & escalators! 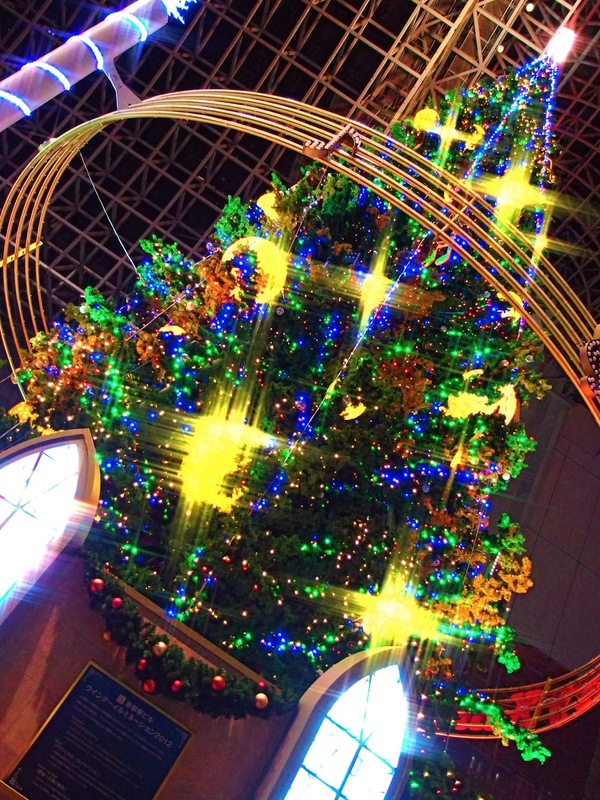 While awaiting our train, we decided to check out and snap a few pictures of the Christmas decorations inside the station. These are the all of the pictures, hope you’ve enjoyed them! Get a Free 10-Day Look with Allianz Global Assistance, the world leader in travel insurance. Get a free quote now. Go to the official website of Rail Europe – Train tickets , essential for traveling all around Europe can be found here along with train schedules, timetables & more! You’ve gotta ❤ Qatar Airways, for never failing to provide reliable, non-stop flights! 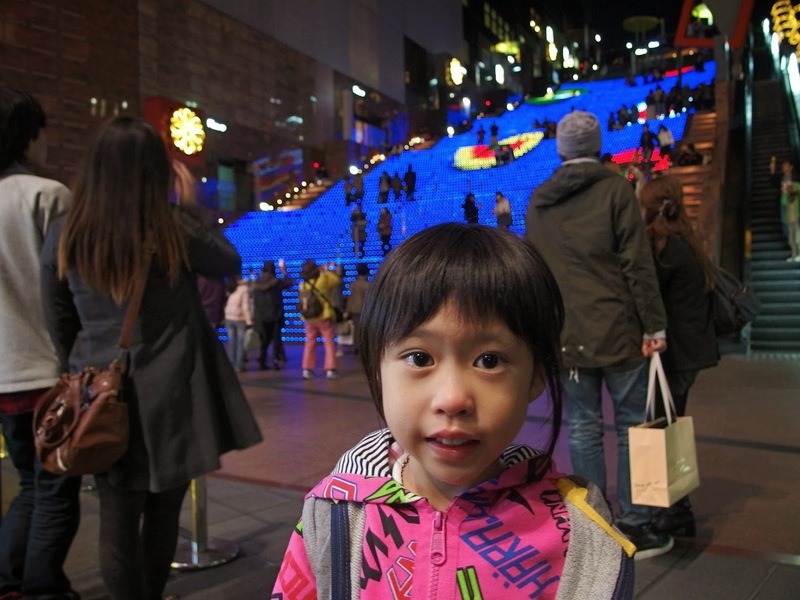 A special thanks to EXPEDIA PACKAGES for making such incredible journeys possible! Follow us as we continue with our travels! If you enjoyed this post and found it informative, feel free to follow me via GFC, Google+, Bloglovin’ etc..
And also, please do ‘Like’ my Facebook Page above! +1’s would be much appreciated too. I hope you’ve enjoyed reading! Thank you Expedia, and Tripadvisor for wonderful Hotels and Bookings! Also to JTB & Japan Travel Info for being a great help! Travelling the world during your retirement? You deserve it so insure your long awaited trip. Get a free quote with Allianz Global Assistance. Wow! The illuminations look so pretty! Hi! Absolutely! This is one of the main events of the year! such a wonderful place to visit! 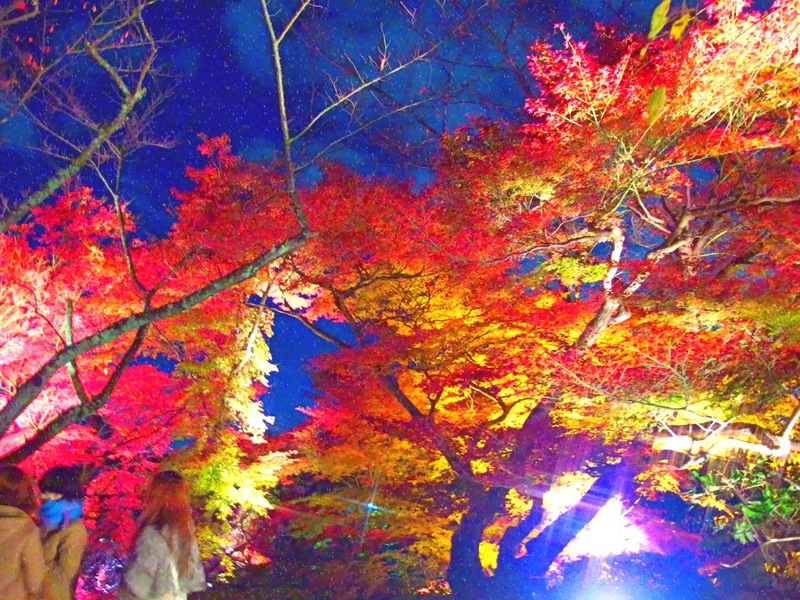 Japan is one of my dream destinations and i cant wait to travel there someday. Thanks for sharing these with me! Looks like an amazing place. Would love to visit it soon.